Before I told you about Poppie’s side of the family from Italy. Now I want to tell you about your paternal grandmother’s (Nonnie’s) side: the Swedes and the Germans. I actually have a lot more information about her side than I do about Poppie’s. Some of it you may find surprising. Before Poppie and Nonnie passed away I interviewed them and got information and photographs of many of the ancestors. Nonnie had some going back several generations even to your great-great-great-grandparents! Amazing to see what these people actually looked like. I hope you enjoy this post as much as the previous one about Poppie’s side of the family. Gertrude Marie Kotz was born on June 1, 1921 at home, 327 218th Street, Springfield Gardens (Borough of Queens), New York City. 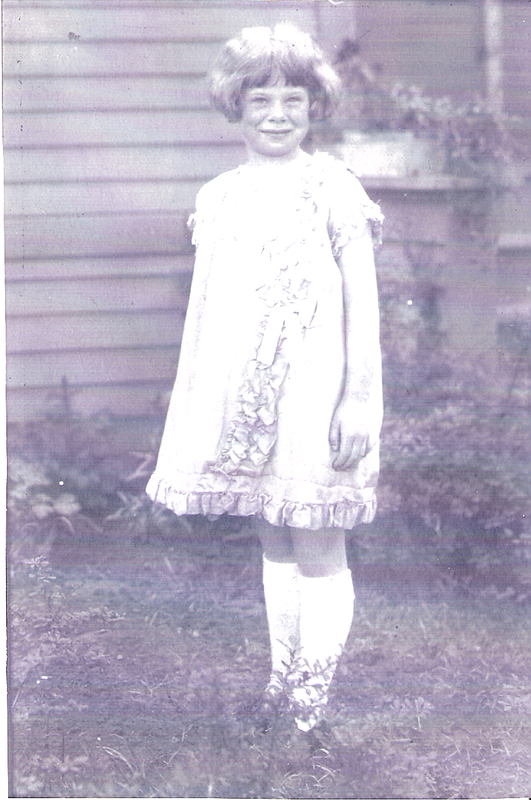 She was the oldest of three children born of John William Kotz and Esther Adele Kotz, nee Johnson. She had one younger sister, Gloria, and one younger brother, John, Jr. (“Jack”). Here is a picture of Nonnie in kindergarten with her sister Gloria. Nonnie is standing in the back, third from the left, next to the Christmas tree. 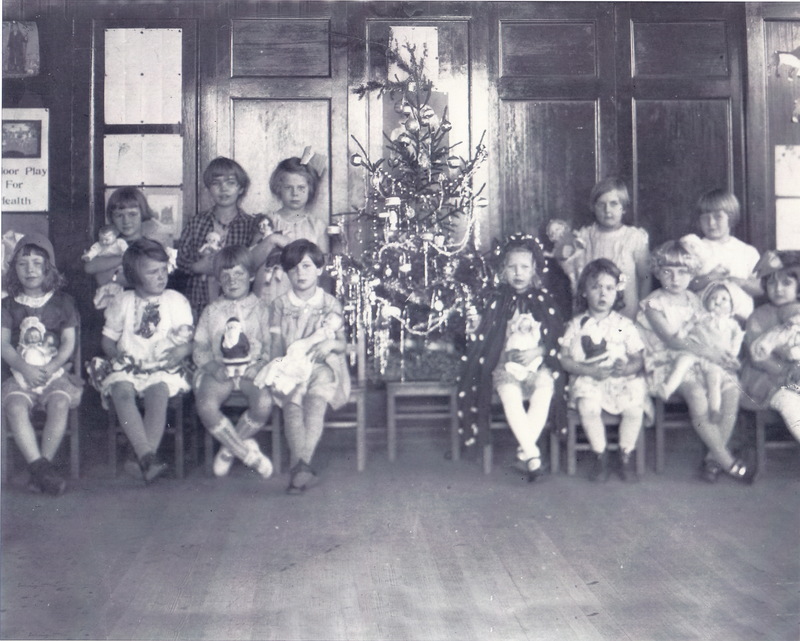 Her sister Gloria is seated fifth from the left, next to the Christmas tree, wearing a kind of Little Red Riding Hood outfit. 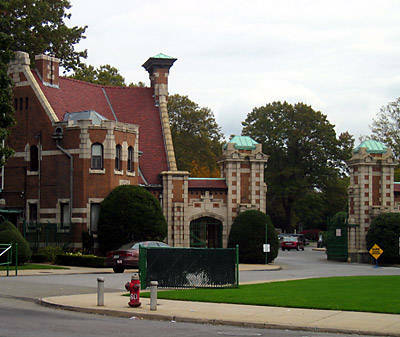 Nonnie spent most of her childhood years growing up Jamaica Park (Queens), New York. 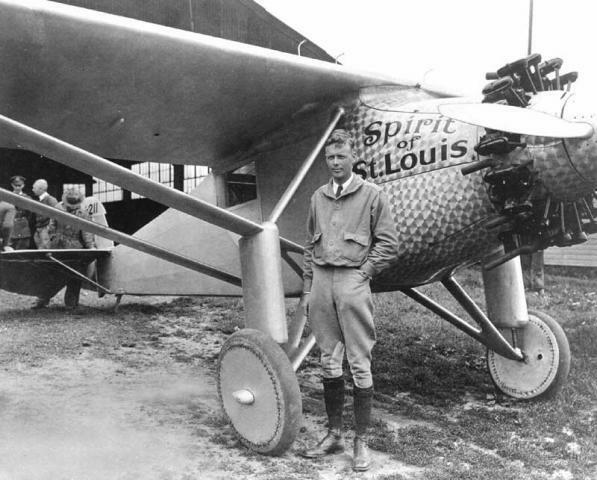 One great story I remember her telling me was how on May 20, 1927, just before her sixth birthday, her father took her and the family to Roosevelt Field, Long Island, to see Charles Lindbergh (“Lucky Lindy”) take off in his Spirit of St. Louis aircraft for the first ever solo transatlantic flight. That must have been an exciting day for little Gertrude and for all the rest of the people who saw him take off! It would have been for the people gathered there something like watching the Apollo 11 spacecraft take off for the first moon landing, I think. 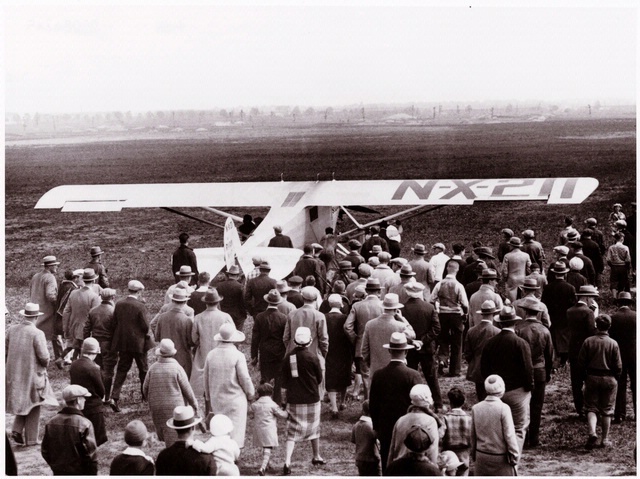 Below is a picture from that historic event at Roosevelt Field. 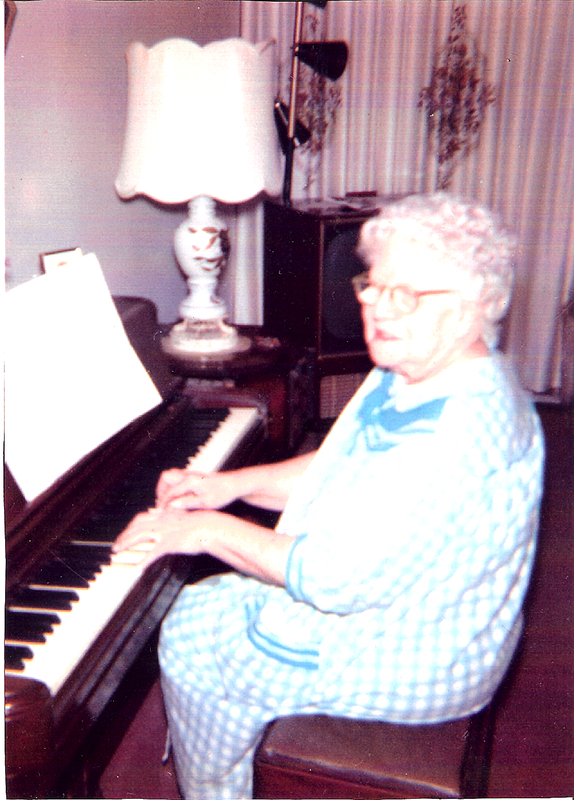 As a young woman, Nonnie was an elementary school teacher for a time. But like Poppie, when World War II broke out she enlisted to serve in the military, in the U.S. Women’s Army Corps (WAC), where she served from 1942 to 1945. This was before the regular army allowed women to join. 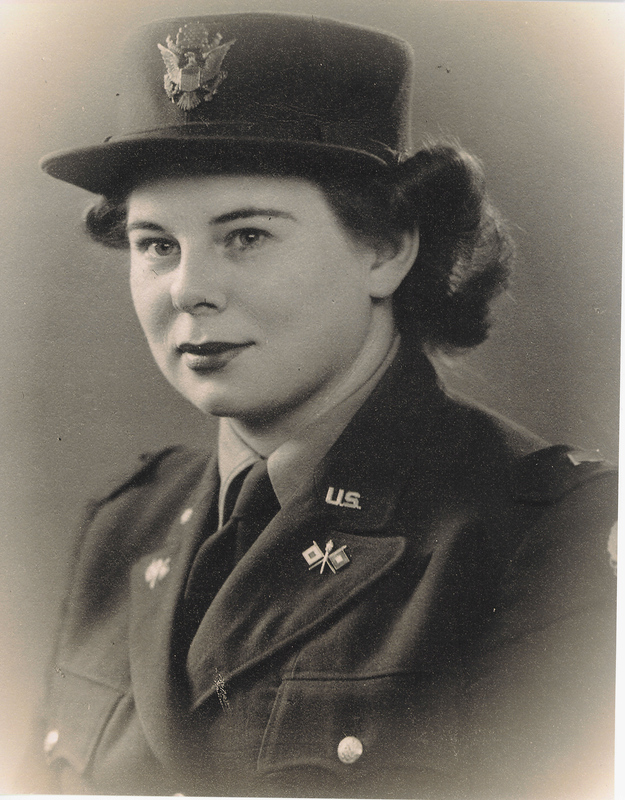 Nonnie was in the first group of American women besides nurses to serve in the U.S. military. 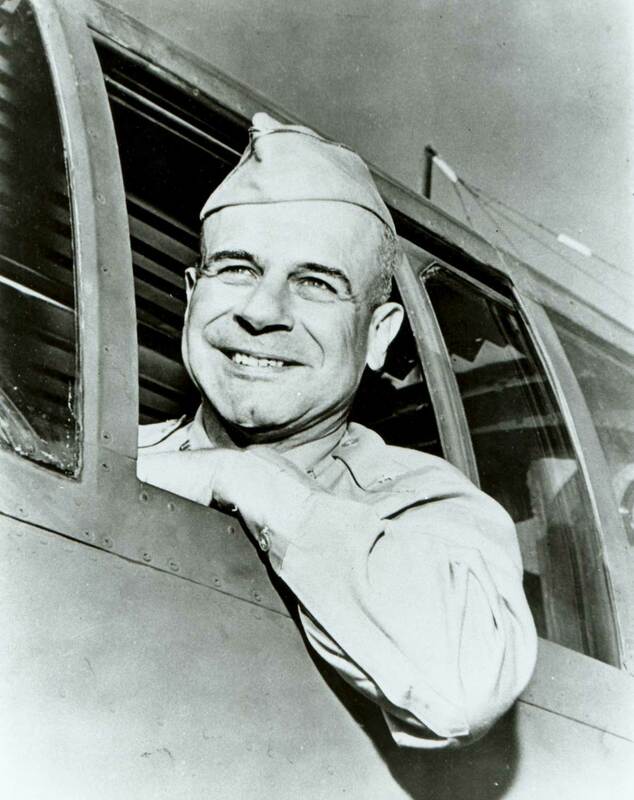 In the WACs she worked on the staff of the famous General James Harold “Jimmy” Doolittle. 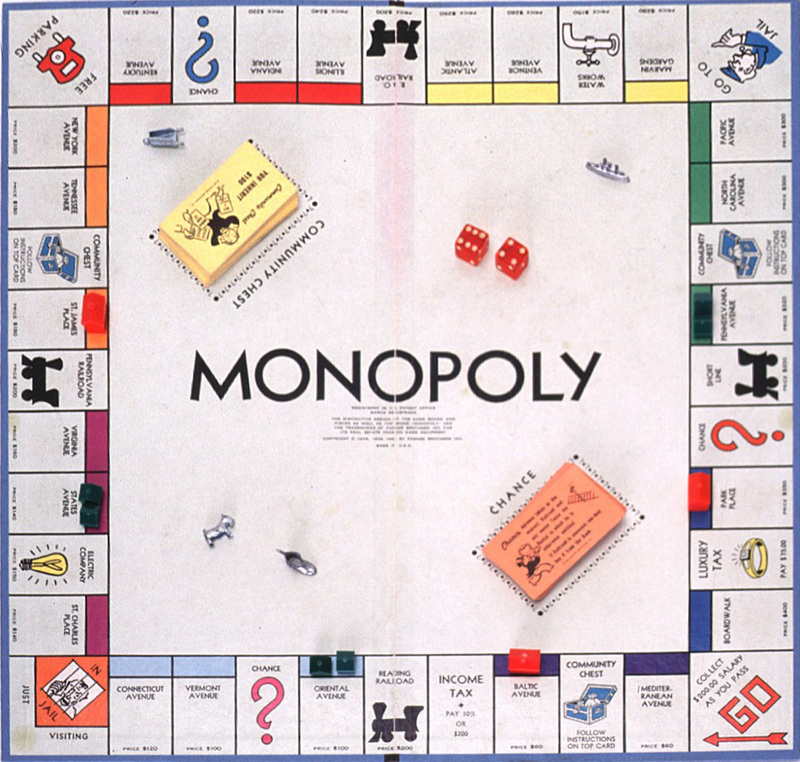 Nonnie was stationed in High Wycombe, England, where the RAF (Royal Air Force) had (and still does have) a base. As I told you before in Poppie’s post, he and Nonnie met while the two of them were stationed over in England during the war. 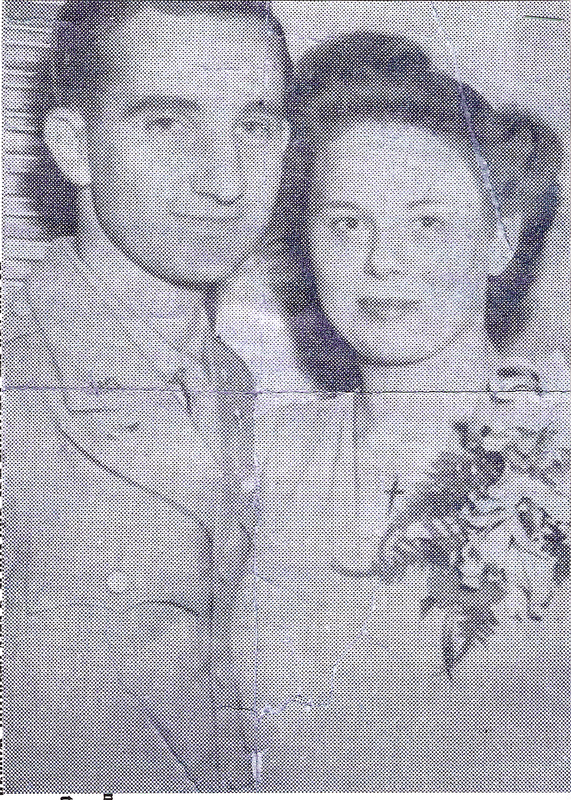 After V-E Day (Victory in Europe Day) they returned to America and got married on Aug. 5, 1945 at St. Monica’s Roman Catholic Church in Jamaica (Queens), New York. Below is a photo from the newspaper notice about their wedding. 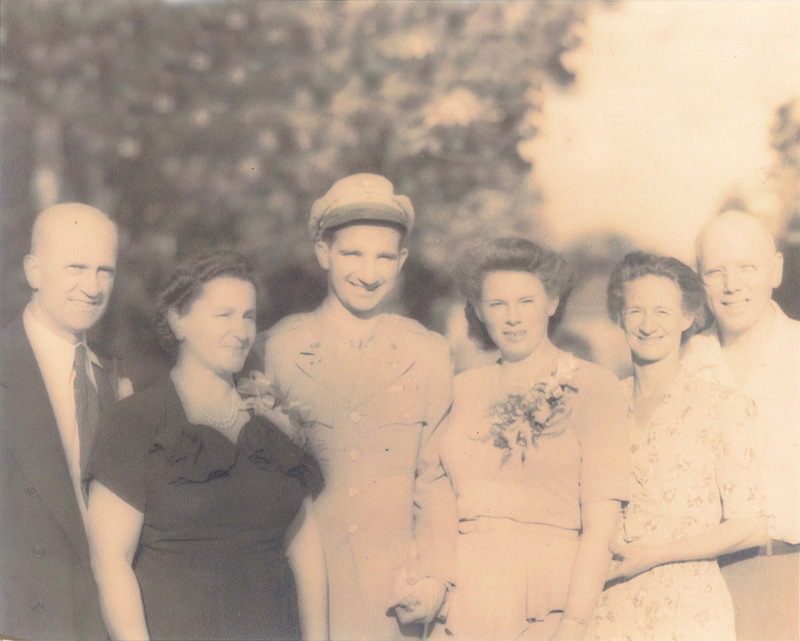 Below is another wedding photo with all your ancestors in it, from left to right: Valentine Del Vecchio (Poppie’s father), Livia “Lena” Del Vecchio, nee Galella (Poppie’s mother), Philip Del Vecchio (“Poppie”), Gertrude Del Vecchio, nee Kotz (“Nonnie”), Esther Adele Kotz, nee Johnson (Nonnie’s mother) and John William Kotz (Nonnie’s father). 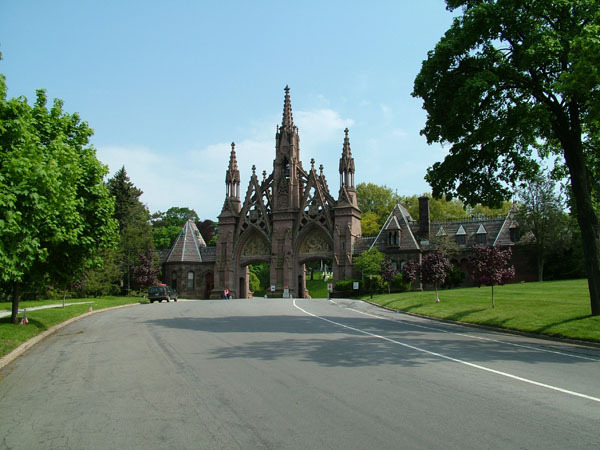 The couple settled down in New Jersey, first in Millburn and then later in Springfield, and raised seven children; Philip, Jr., Valerie, Denise, Peter, Paul, Anthony, and David. 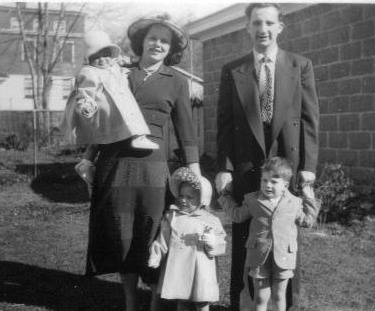 And here’s a picture of the Del Vecchio family at their home on Henshaw Avenue in Springfield circa 1955. 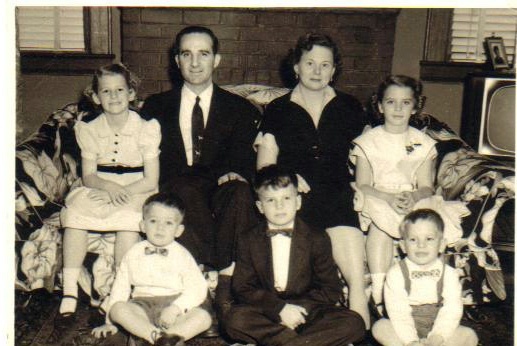 Pictured are rear left to right, Denise, Poppie, Nonnie, Valerie, and from front left to right Paul, Phil, Jr., and Peter. 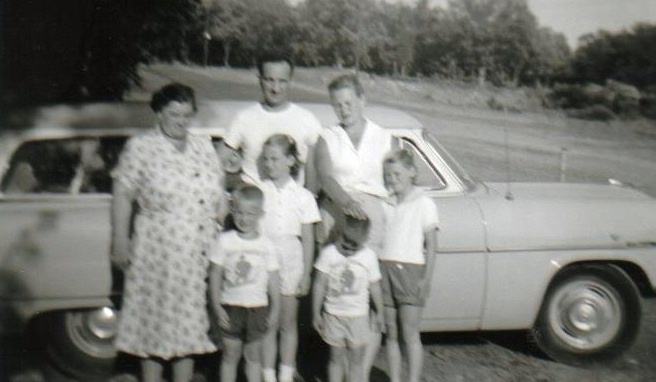 And here’s another picture of the family on an outing standing in front of their old Ford Wagon. 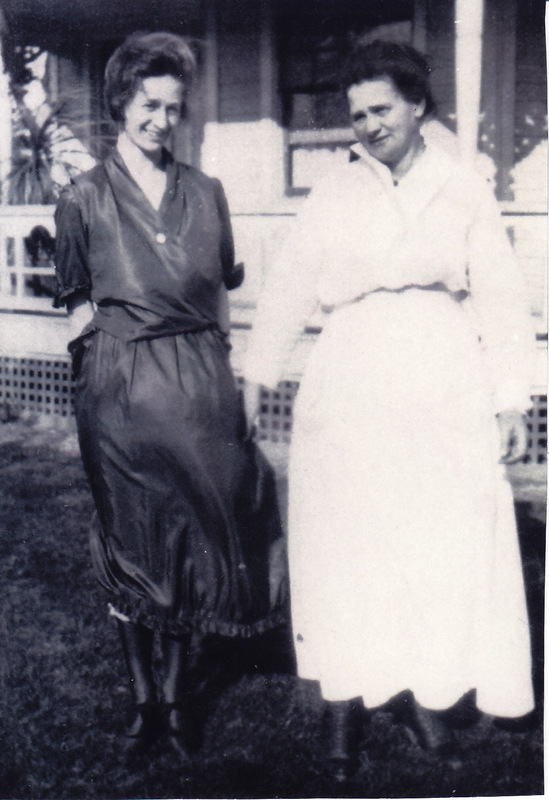 (Pictured on the left is your Great-great-aunt Minnie Galella, Livia Del Vecchio’s [your Great-grandmother’s] sister). Nonnie was very active in the local community. 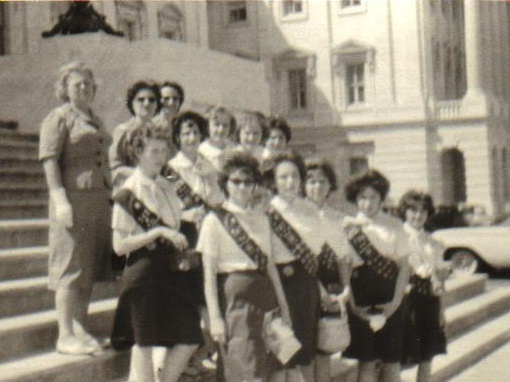 One of the things she was involved with was the Girls Scouts, where she was a Troop Leader. I inherited Nonnie’s love of nature and that’s probably why I took up trekking and camping as a pastime. Poppie didn’t like the outdoors too much, except for the beach. 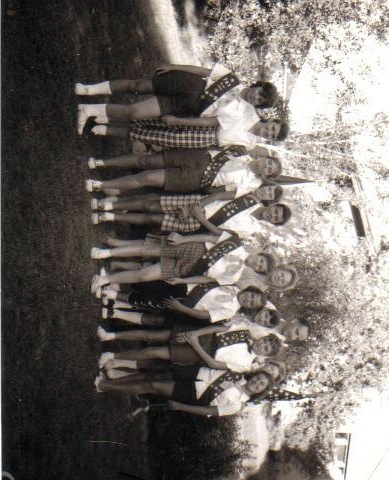 Below are a couple of pictures of Nonnie with some of the girls in her troop. By 1960 all seven children in the family had been born (I was number six). Funny thing is, Nonnie had some sort of accident when she young, I think in England, maybe (I can’t recall the details) and the doctors told her she wouldn’t be able to bear children. Boy, were they ever wrong! The year before I was born Phil and Gert built their dream home at 11 High Point Drive in Springfield where I grew up. 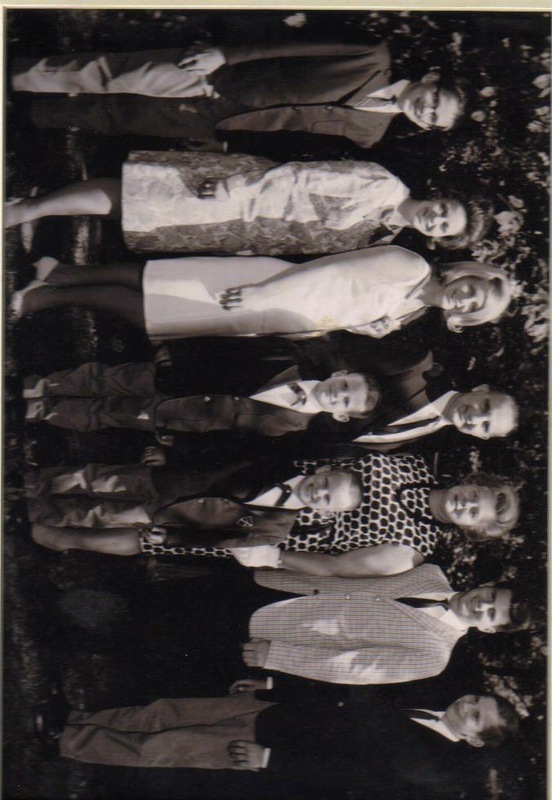 Here’s a picture of the entire family taken around 1965 or 66. 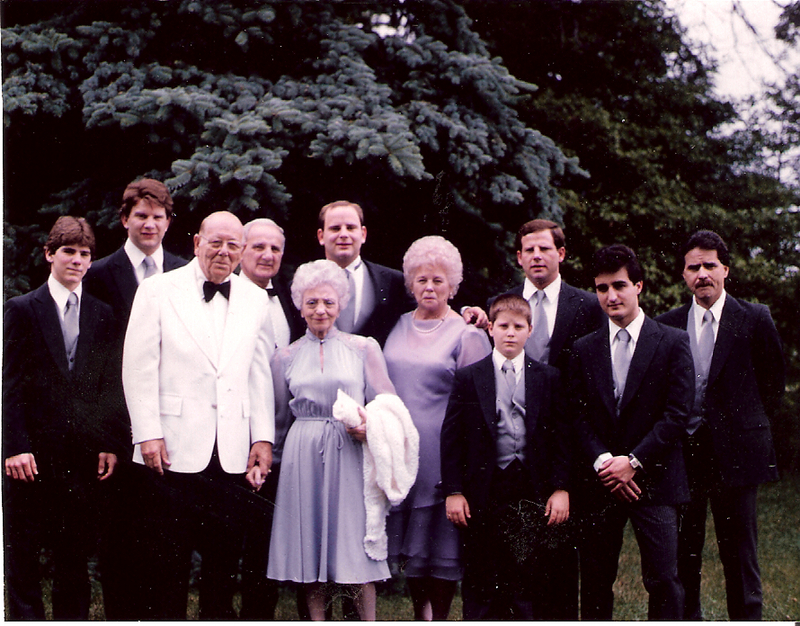 They are from left to right Paul, Valerie, Denise, Phil, Sr., Gert, Phil, Jr., Peter, and Tony and David in front. 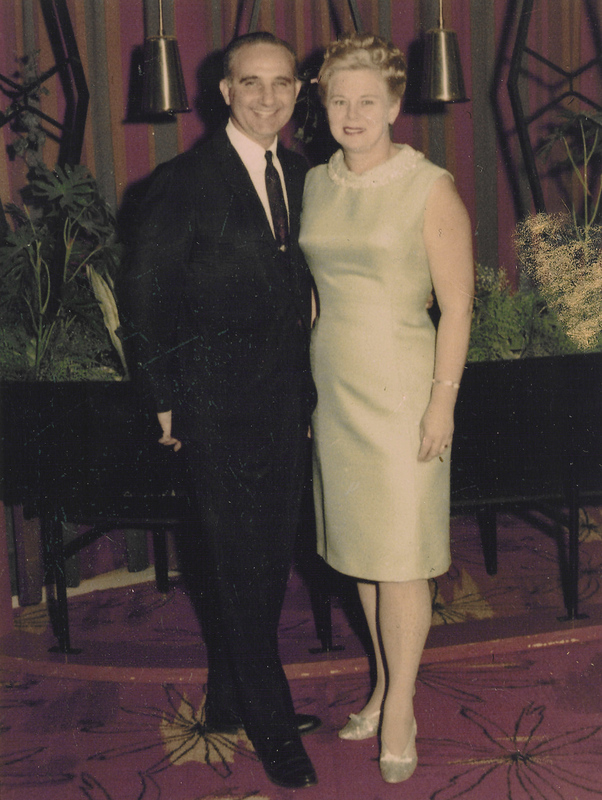 Below are a couple of pictures of Poppie and Nonnie at some political functions back in the mid-sixties. 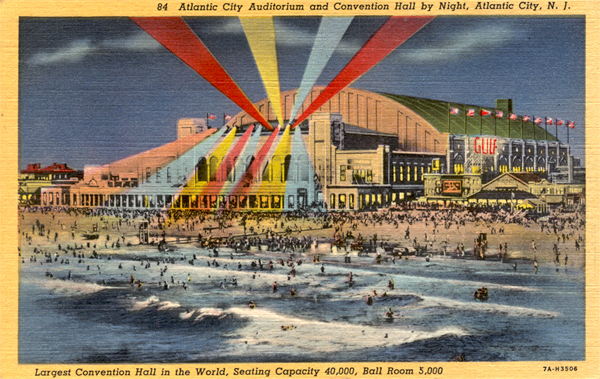 I remember when we were young your Uncle David and I used to go with Nonnie and Poppie to Atlantic City, New Jersey where they attended these political conventions at the historic Atlantic City Convention Hall, now known as Boardwalk Hall. Those were some great memories. 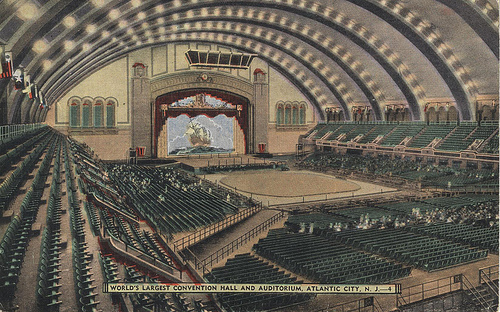 This was all before Atlantic City allowed gambling, and it was like stepping back in time 20 or 30 years. Jitneys (small public transportation buses) ran along the streets, and it was cool seeing all the street names from the board game Monopoly. We used to walk along the Boardwalk, where we’d buy salt water taffy and toys, go to the wax museum, eat roast beef sandwiches, and do lots of other things. When the parents were at the conventions we used to play pinball and go swimming in the wintertime in the hotel’s indoor pool, which was on top of the building and covered with a big inflatable doom. The whole experience was really magical. 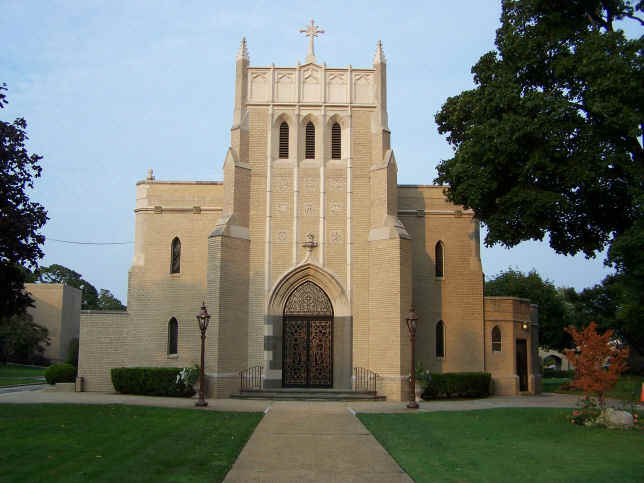 Nonnie was also a strict Catholic, and participated in many church activities at the St. James Roman Catholic Church in Springfield. 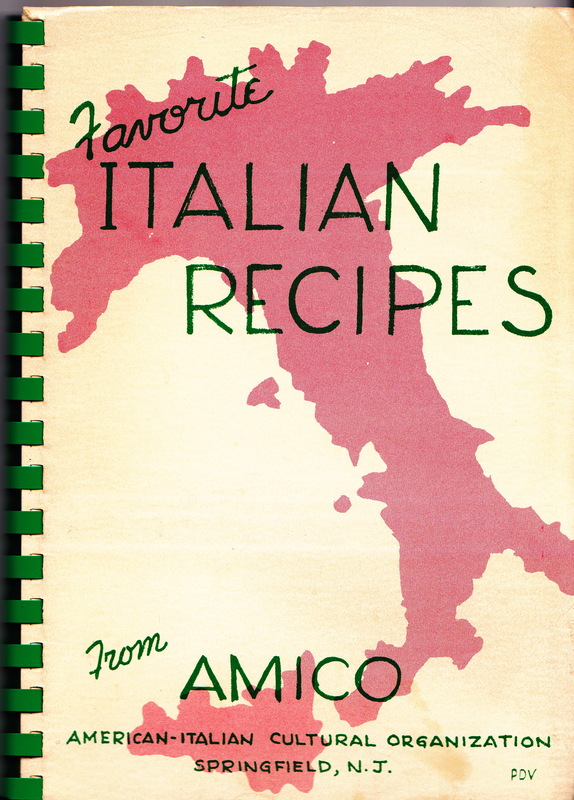 She was also a founding member of AMICO, Springfiled’s Italian-American organization. She was the driving force behind the creation of their cookbook (you can find the whole thing on this blog). She was a great cook and many of the recipes in the cookbook are hers. Please try them sometime! They’re delicious. 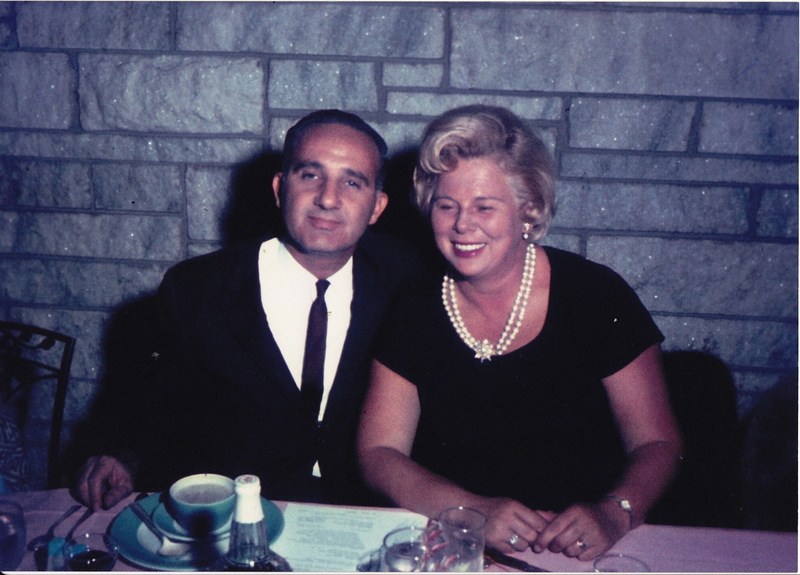 After the kids all grew up and moved away, Nonnie and Poppie sold their home at 11 High Point Drive and lived for a time at a condominium in Red Bank, New Jersey. 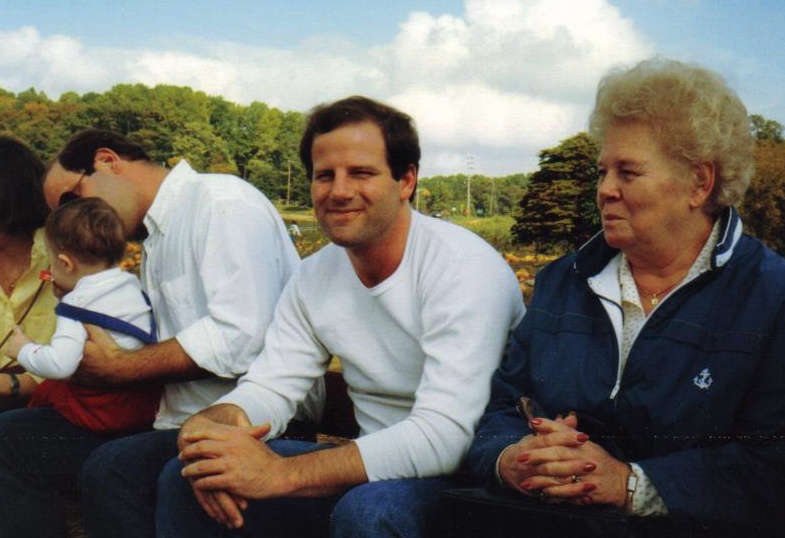 Here is a picture of Nonnie and me on a pumpkin picking trip in October 1985 on a farm in that part of New Jersey. They later bought a condo in Lake Worth, Florida as well so that Nonnie could look after her father who lived down there. Poppie shuttled back and forth between New Jersey and Florida while he was semi-retired to do insurance and engineering inspection jobs. 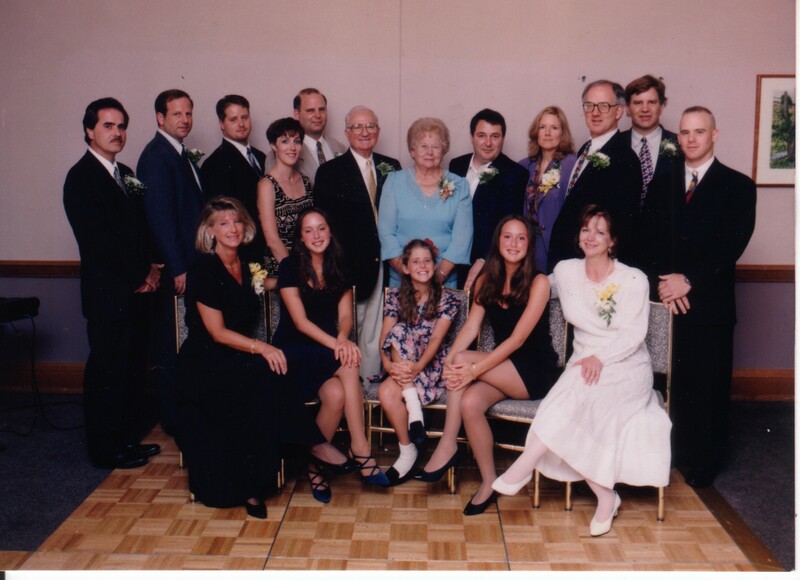 In August 1995, the whole family got together for Nonnie and Poppie’s 50th Wedding Anniversary. 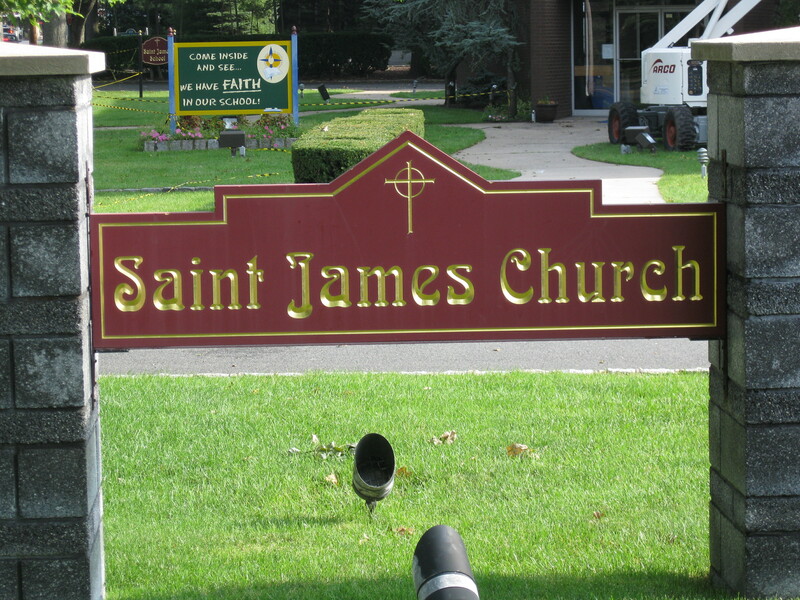 They had a ceremony at St. James and reaffirmed their marriage vows, and later we had a big celebration at the Short Hills Hilton. I flew in from Japan for the occasion, of course. 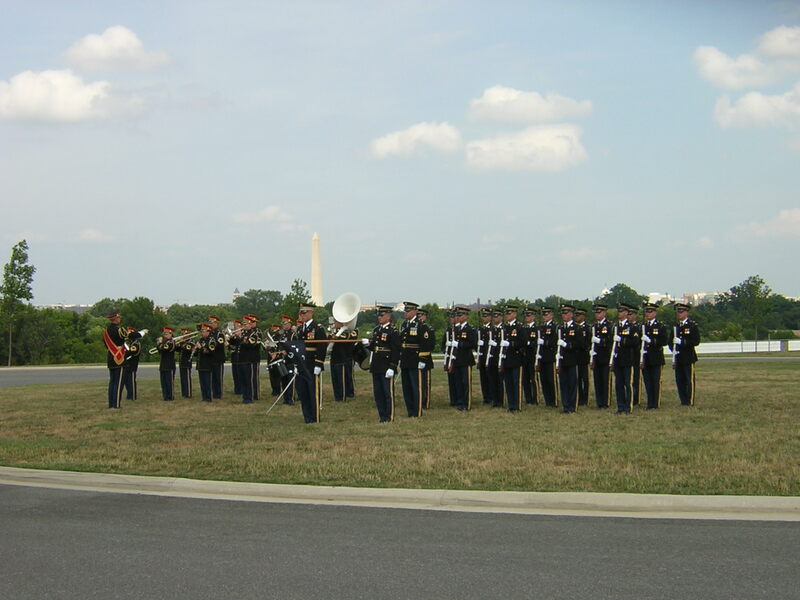 Below is a picture from that day. At the rear from left to right are Uncle Tom Gallaro (Aunt Denise’s husband), me, your cousin Matt Gallaro (Tom and Denise’s son), Aunt Suzanne (Uncle David’s wife), Uncle David, Poppie, Nonnie, Uncle Elio Serra (Aunt Valerie’s husband), Jenny (Uncle Paul’s girlfriend), Uncle Paul, Uncle Peter, and your cousin Mike Gallaro (Tom and Denise’s son). In front from left to right are Aunt Denise, your cousin Francesca Serra (Elio and Valerie’s daughter), your cousin Cristina (Tom and Denise’s daughter), your cousin Daniela (Elio and Valerie’s daughter; yes, Francesca and Daniela are twins), and Aunt Valerie. 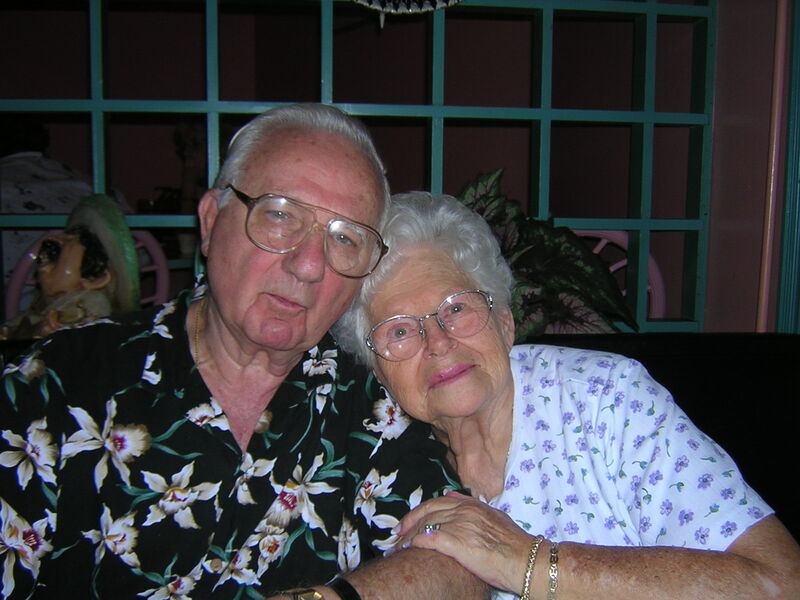 After Poppie retired completely from the engineering business he and Nonnie bought a house in Boynton Beach, Florida, which you probably remember. 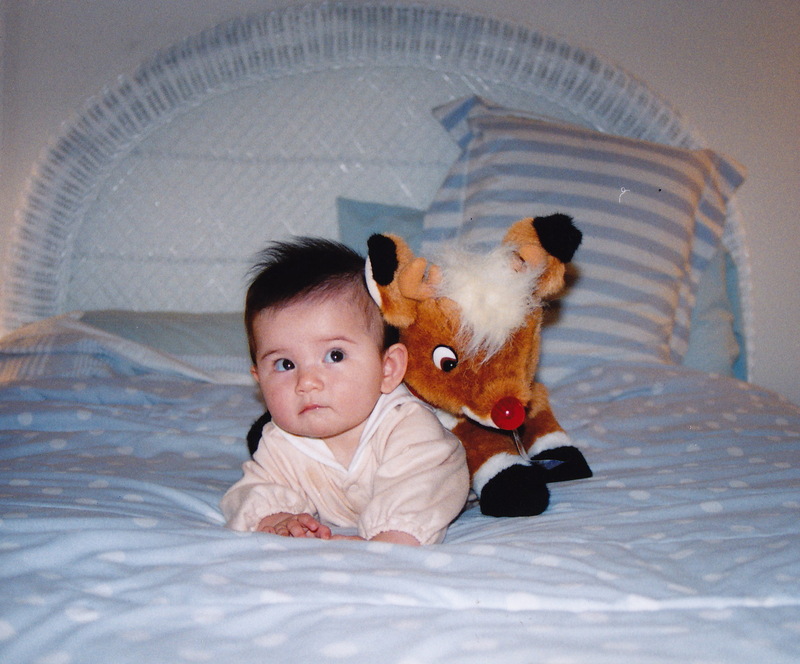 Here are some pictures of your first trip there at Christmas 1998. We visited them five or six times altogether. 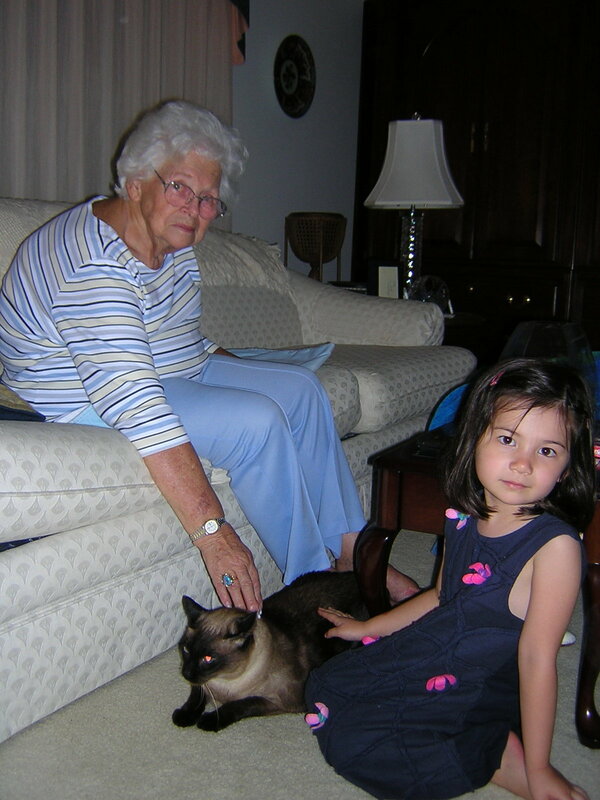 Below is a picture of you and Nonnie from March 2003 playing with their cat, Ali. 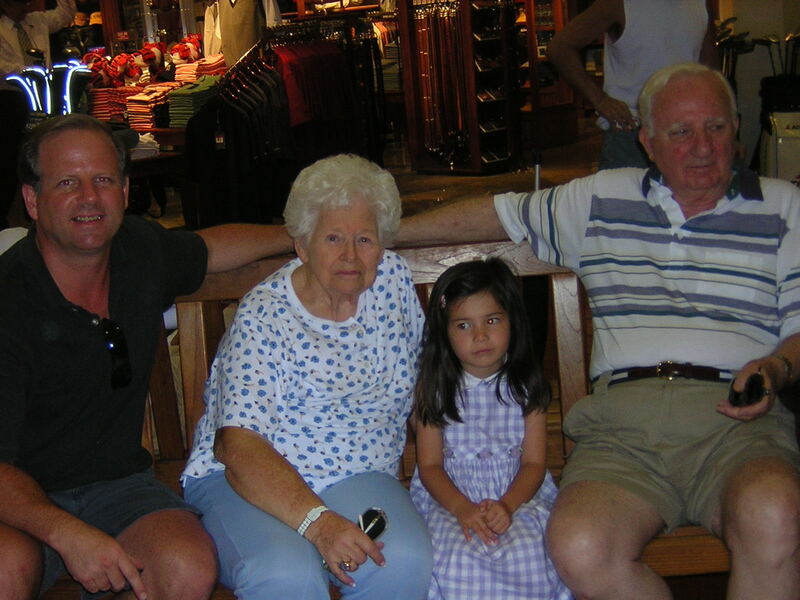 And here are a couple from the last time we visited them together in August 2003. 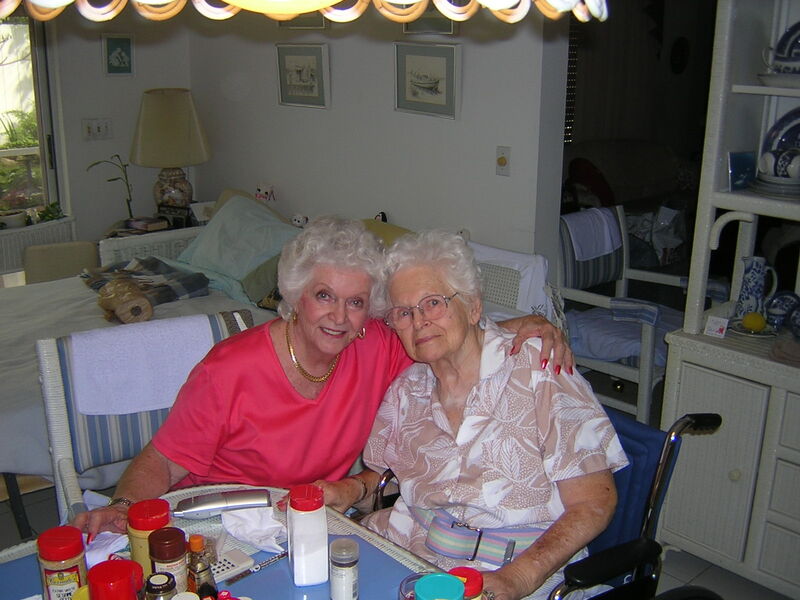 Nonnie became infirm in the last years of her life due to osteoporosis and had difficulty moving around. She first had to use a walker and then eventually a wheelchair. But her mind was always strong and she never lost her spirit. Here are some photos of Nonnie from my trip there in 2004. The first with me and Poppie, of course, and the second with her friend, Honey. She always asked about you and she knew how difficult it was for me hardly ever seeing see you (the last time I saw you was for a half hour right after she died in January of the next year). 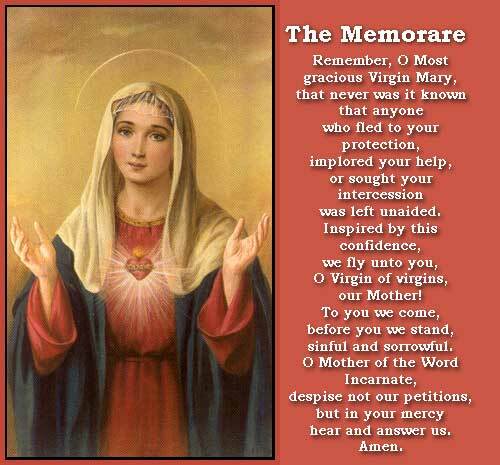 So she taught me a prayer soon before she passed away called the Memorare, telling me I should never give up hope. 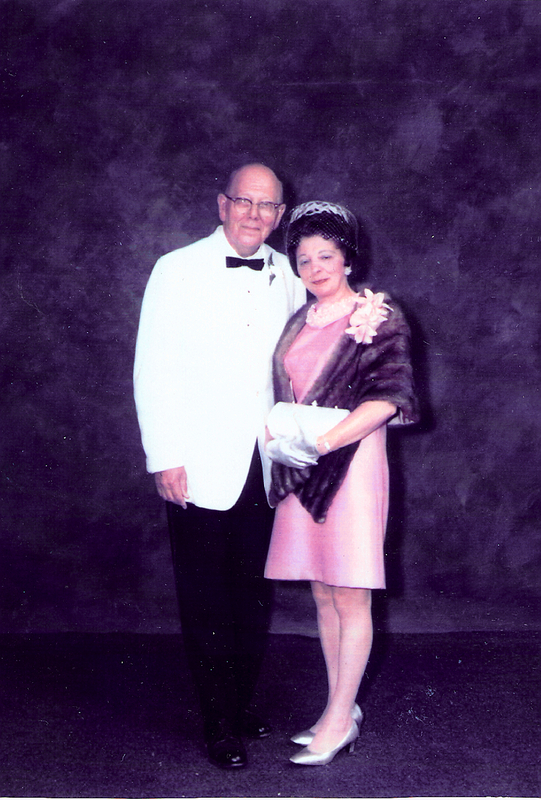 Nonnie and Poppie moved to Houston, Texas at Uncle Peter’s suggestion as they needed help at that point. They lived in an apartment in Peter’s complex and got to spend time with their grandchildren. Sadly, Nonnie was in the hospital most of the time towards the end of 2004. I went to visit her there twice in early and late December. The night before she died she told Poppie, “I want to go home.” She knew her time was near and she wanted to be alone with her loved ones when it came. Uncle Peter bought a nice bouquet of flowers for her, and your Aunt Nair helped dress her in a new outfit, did her hair, put on her makeup, and gave her a manicure. The next day she passed away peacefully in the company of her husband, Phil, and her son, Peter. I went back for the funeral right after I met you for that last time at the train station in Makuhari. There was a church service and we all spent the day together reminiscing about Gert. That evening we had a wonderful meal at a great Italian restaurant in Houston. We put up a couple of framed photographs of Nonnie and ate and drank and talked and laughed about the many happy times we all shared together. 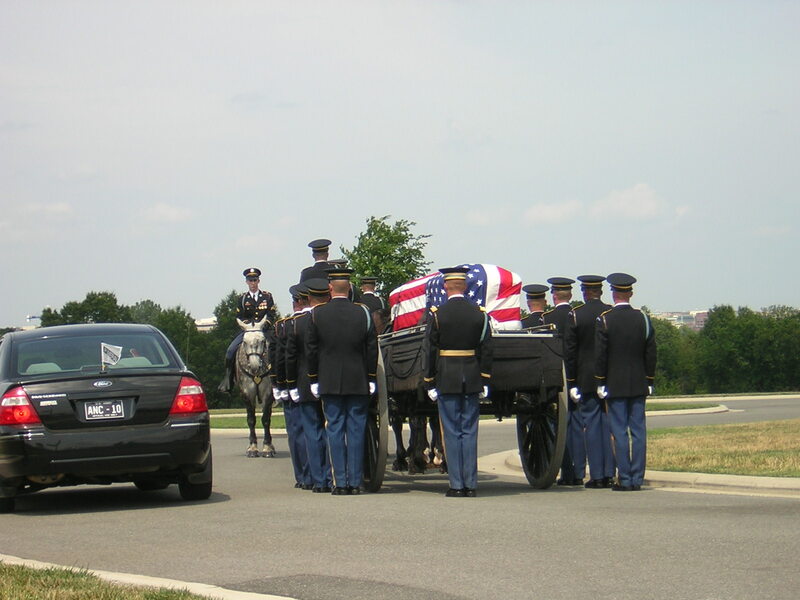 As I told you in the other post about Poppie’s side of the family, after Poppie passed away in May 2008, Nonnie and Poppie’s ashes were interred together at Arlington National Cemetery in Washington, D.C. at a ceremony on August 5, 2009. 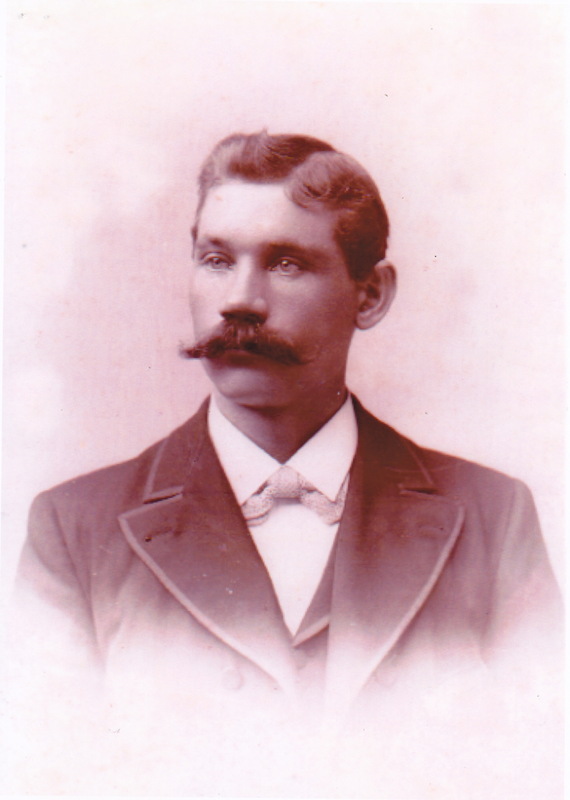 John William Kotz was Nonnie’s father, and the son of Henry John Kotz and Emma Kotz, nee Reis. 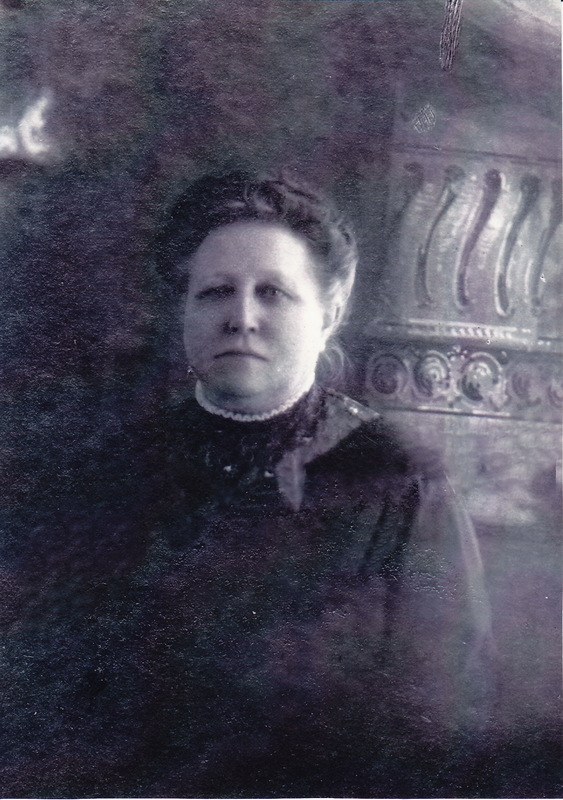 Esther Adele Kotz, nee Johnson was Nonnie’s mother and the daughter of Adolph Gustave Johnson and Anna Ingaborg Johnson, nee von Bitzen. Both John and Esther were born in New York City; John in the Borough of Brooklyn and Esther in the Borough of Queens. Here’s what the New York City skyline looked like in 1900. 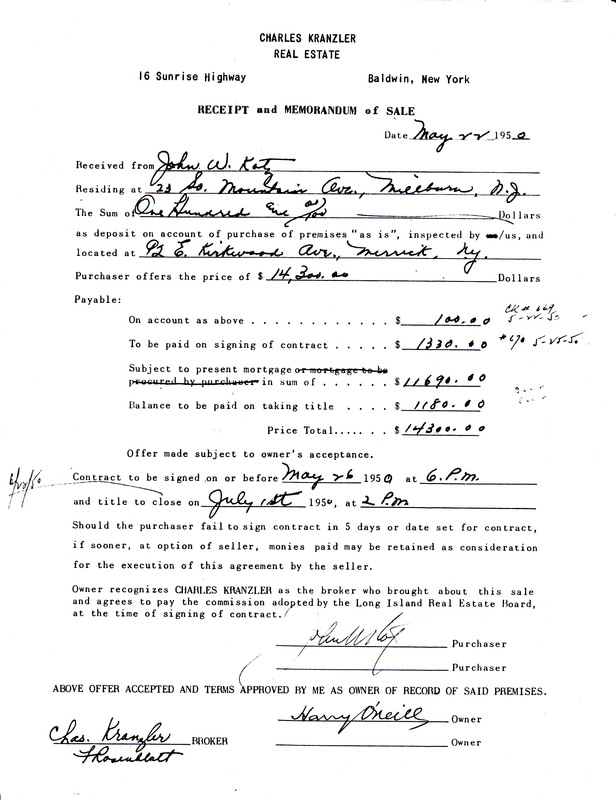 John William Kotz was born at home, 171 Bleecker Street, Brooklynn, New York on August 25, 1900. Below is John’s baby picture. He was the oldest of six children, having two brothers, Harry Anthony and Aloysisus, and three sisters, Margaret, Anna, and Elizabeth. Below is a picture of John when he was seven years old. John was raised a Roman Catholic. His family went to St. Barbara’s Church on Bleecker Street in Brooklyn, where he was definitely baptized and most likely received his First Communion and had his Confirmation as well. 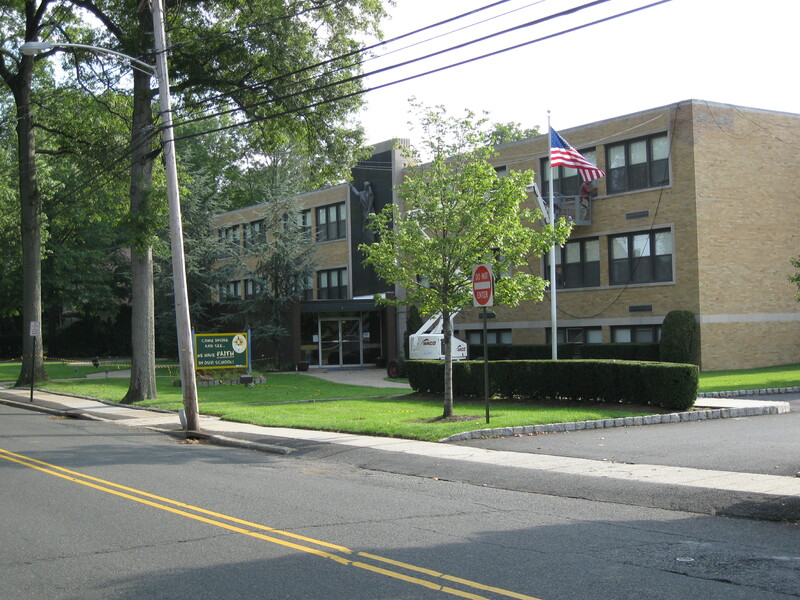 John attended elementary school at P. S. 37 (Public School 37) in Springfield Gardens. 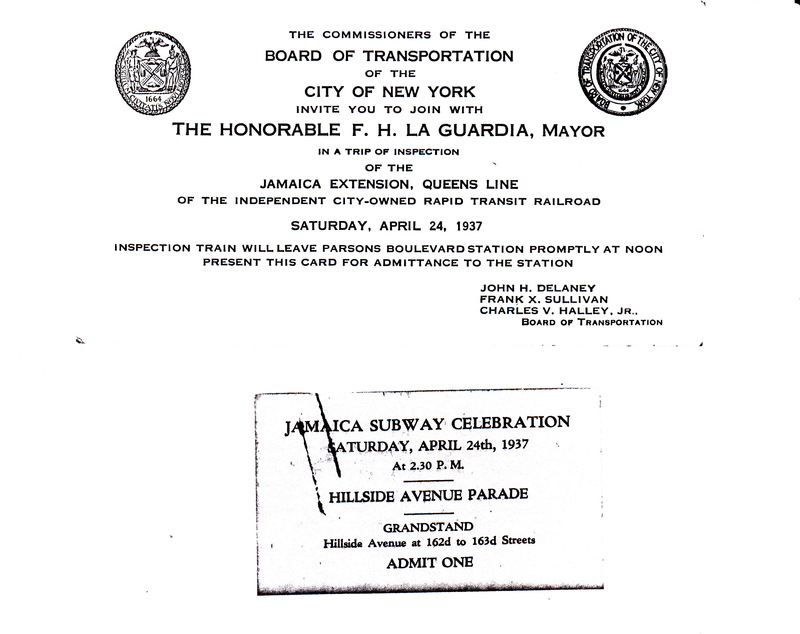 Living in Brooklyn, it was natural that John would have visted Coney Island often. 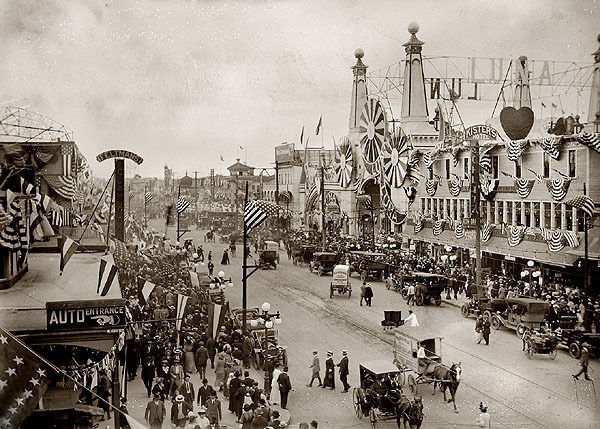 Coney Island was the first permanent amusement park in North America and would have been for a kid at the time like growing up next door to Disneyland, even more so as even electric lights were still fairly new back then, and Coney Island was festooned with them. They had a flume ride (like the one we went on at Toshimaen), a carousel, a ferris wheel, and lots of other exciting things that for a boy in the early 1900s must have seemed magical. Below is a picture of John as a young boy at Coney Island. On his right is his grandmother (your great-great-great-grandmother) Margaretha Reis, nee Bitzermann, and on his left is his other grandmother (your other great-great-great-grandmother) Barabara Kotz, nee Boening. 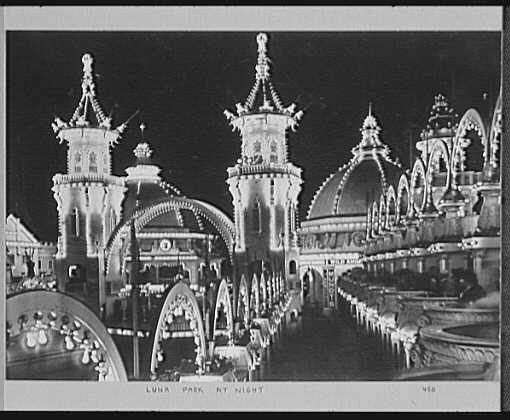 Here’s a picture of Luna Park at Coney Island taken in 1907, right around the time the photograph above was taken of John with his grandmothers. One interesting story I remember Grandpa Kotz telling me was how as a kid he would make money by working on the Jewish Sabbath (from Friday evening through Saturday) lighting stoves for Jewish people in the neighborhood. Strict Jewish religious practices said that you weren’t supposed to work on the Sabbath, and even lighting your own stove was considered work. (Actually cooking was not, oddly.) 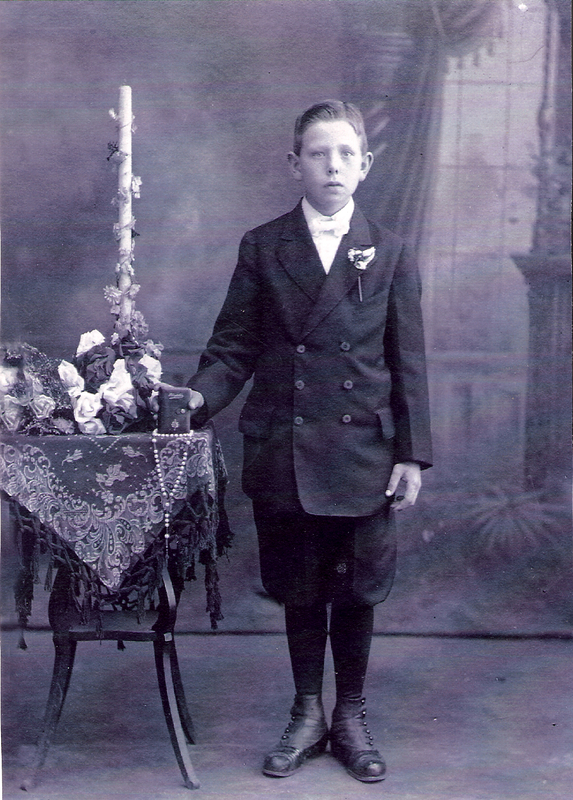 Anyway, young John Kotz earned a nickel (five cents) for each stove he lit, a fortune for a child at the time. I’m sure he spent some of it, at least, on the rides and attractions at Coney Island. As a boy, John probably was fan of the Brooklyn Dodgers as well. This was decades before they moved to Los Angeles in 1958. 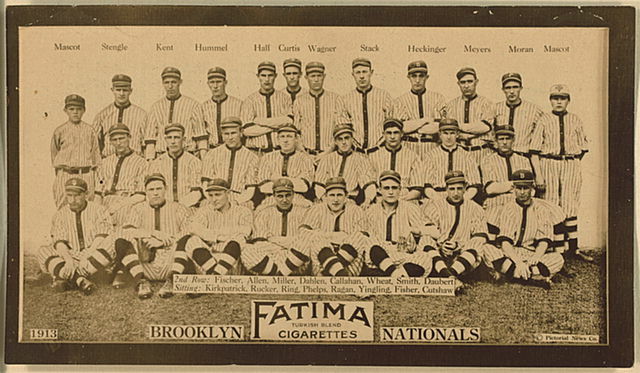 Here’s a picture of the team in 1913. 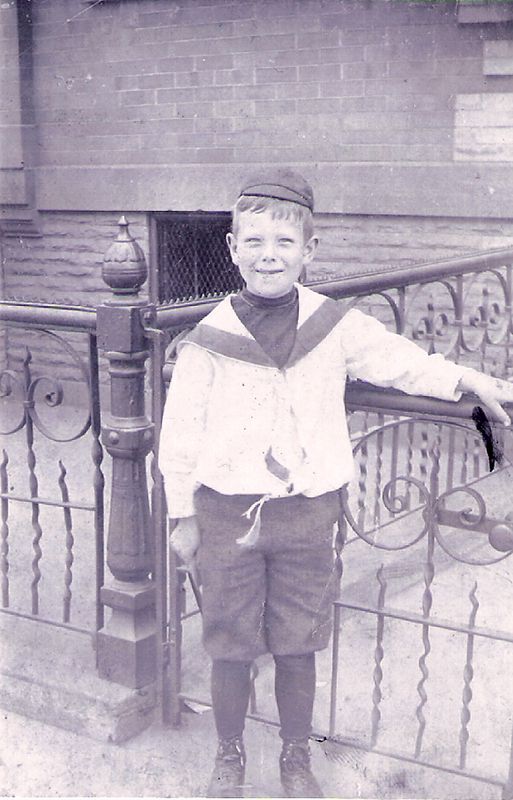 After graduating from elementary school, John went to Jamaica High School but had to quit to earn money to support the family when his father died in December 1916. 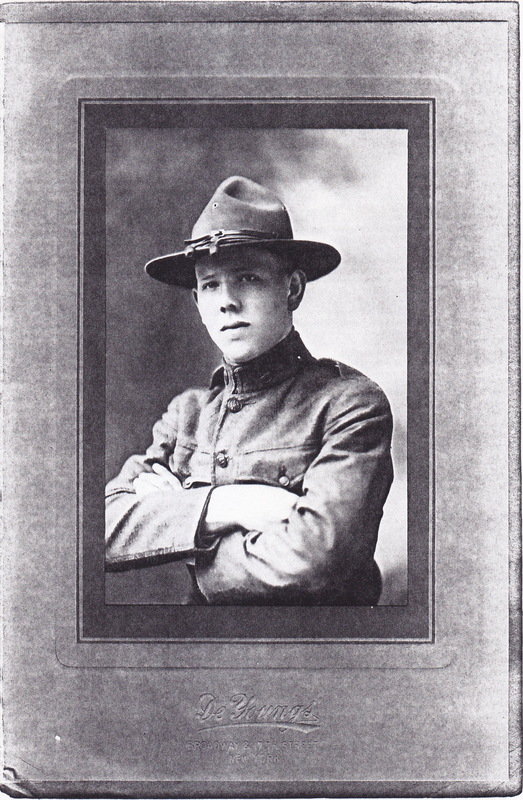 On January 27, 1917, when he was only 16 years old, he enlisted as a Private in the New York Guard (what is now the New York National Guard). 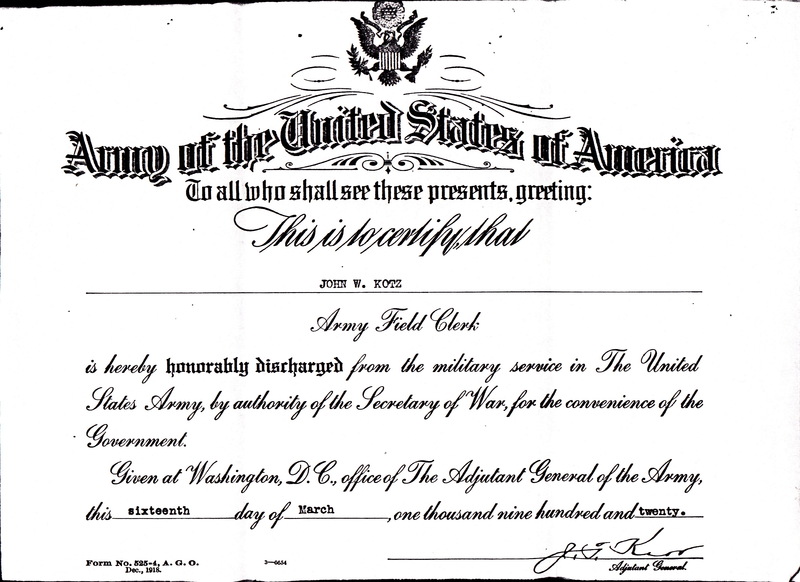 He served there until October 21, 1918, when received an Honorable Discharge to serve in the regular U.S. Army where he was commissioned as an Army Field Clerk. 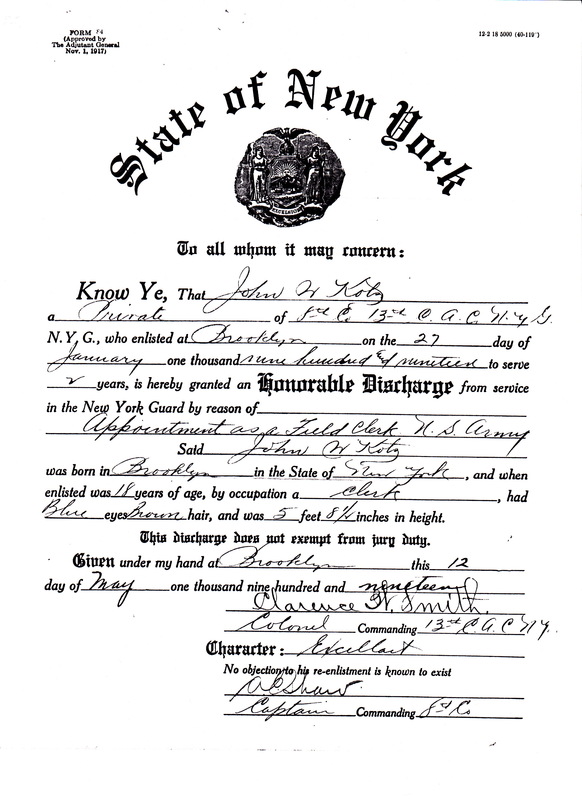 After two years of service in the New York 69th Regiment John received an Honorable Discharge from the U.S. Army on March 16, 1920. After his discharge he worked for a short time as a sales correspondent (sales representative) with the Linde and Prest-O-Lite Company. He and Esther Adele Johnson became married on Oct. 2, 1920 at St. Mary Magdalene Church, Springfield Gardens (Queens) New York. 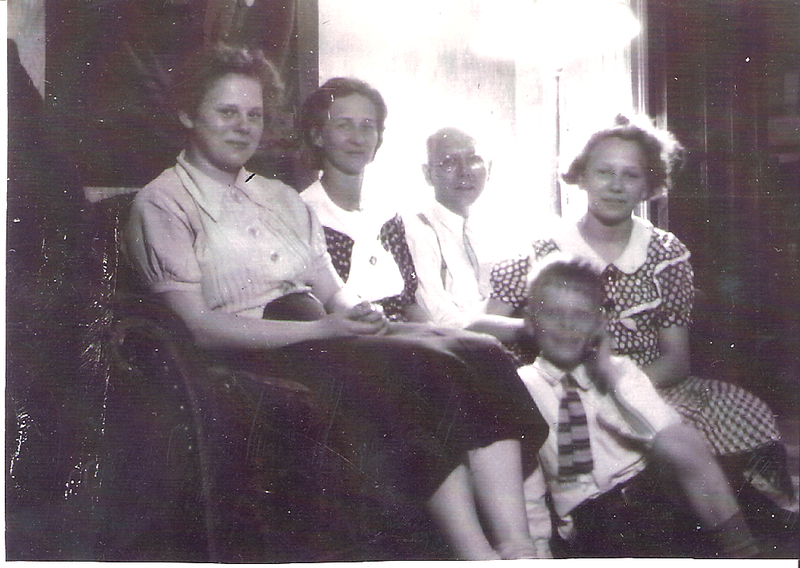 Below is a picture of the whole John W. Kotz family taken circa 1934 when Nonnie was around 13 or 14 years old. 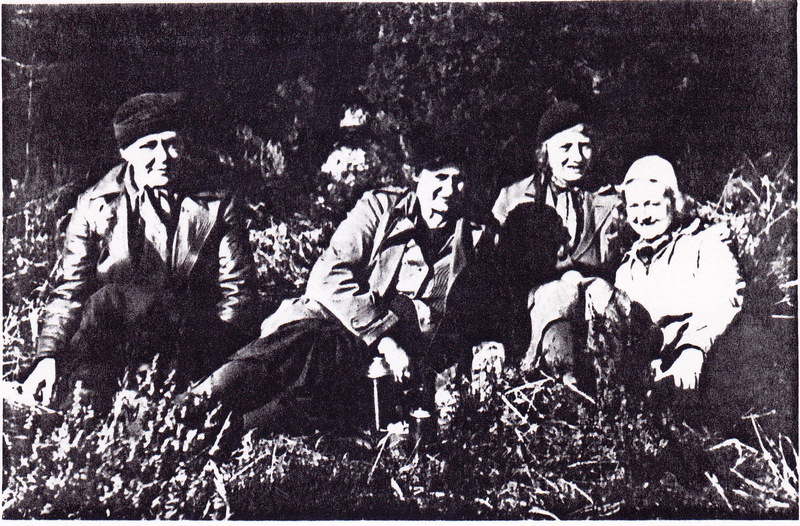 Pictured are, from left to right, Gertrude, Esther Adele, John William, Jack, and Gloria. John then went to work as an accountant for the Southern Pacific Railroad in 1920 and stayed with them for many years, long enough to earn a railroad pension. 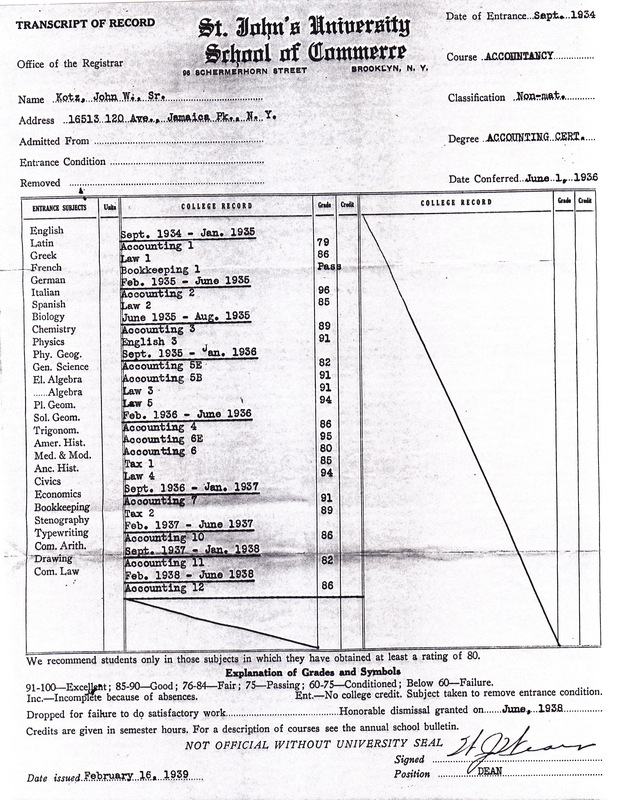 Here is his resume showing much of his early work history. 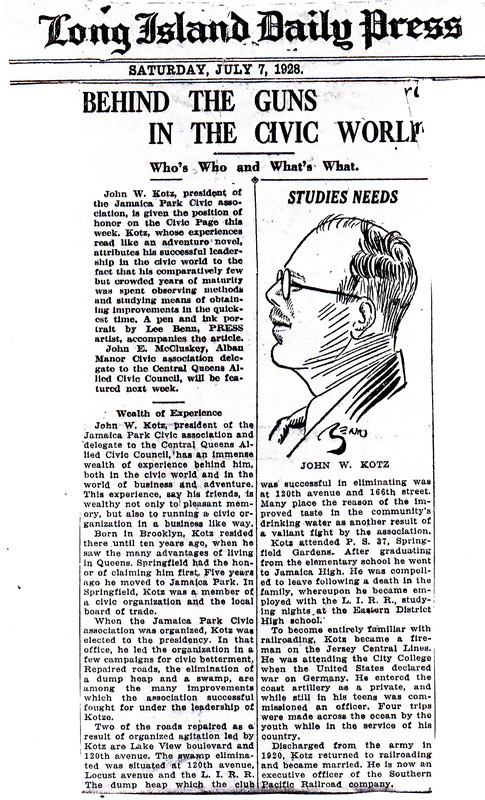 In addition to his employment with the railroad, John W. Kotz was also involved in local politics, and was first President of the Jamaica Park Civic Association. Here are a couple of newspaper articles about your great-grandfather. As I mentioned earlier, John Kotz had to quit high school after his father passed away. He was the oldest son and had to earn money to support the family. Nevertheless, he did complete high school degree at night. Although he was already employed as accountant for the Southern Pacific Railroad, John went back to school again at night when he was 34 years old to get a university education. 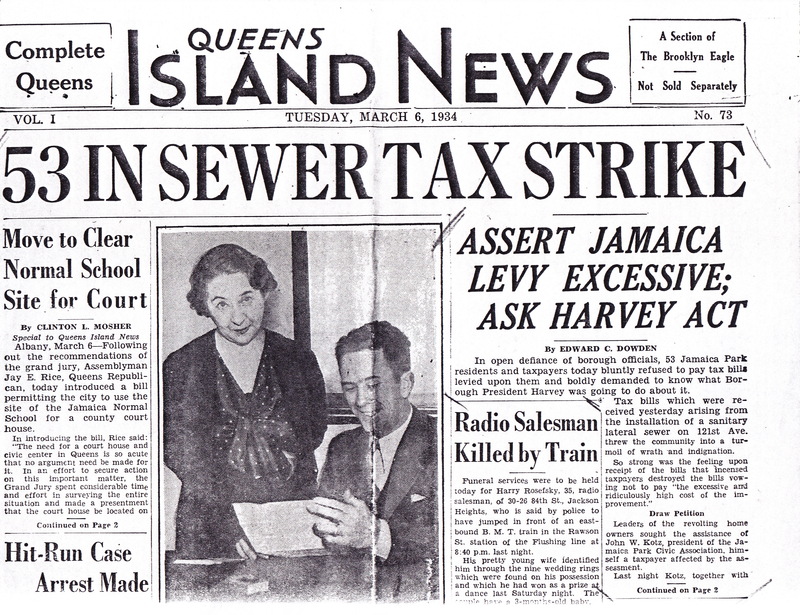 He enrolled at St. John’s University in Brooklyn and received a Certificate in Accounting (like an Associate’s Degree) from the School of Commerce there in June 1936. 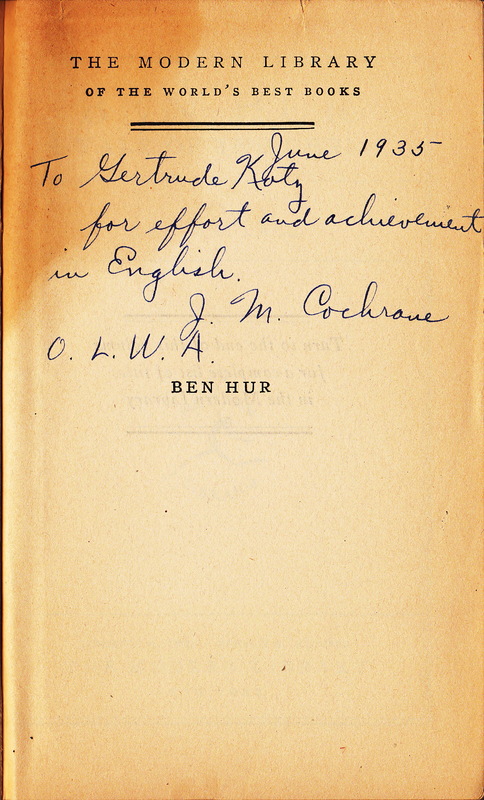 He also did post-graduate work at St. John’s through June 1938. Attaining this level of education was not all that common in the 1930s, especially for a breadwinner supporting a wife and three children during the Great Depression and attending school at night. Nevertheless, John stuck it out and was very successful. 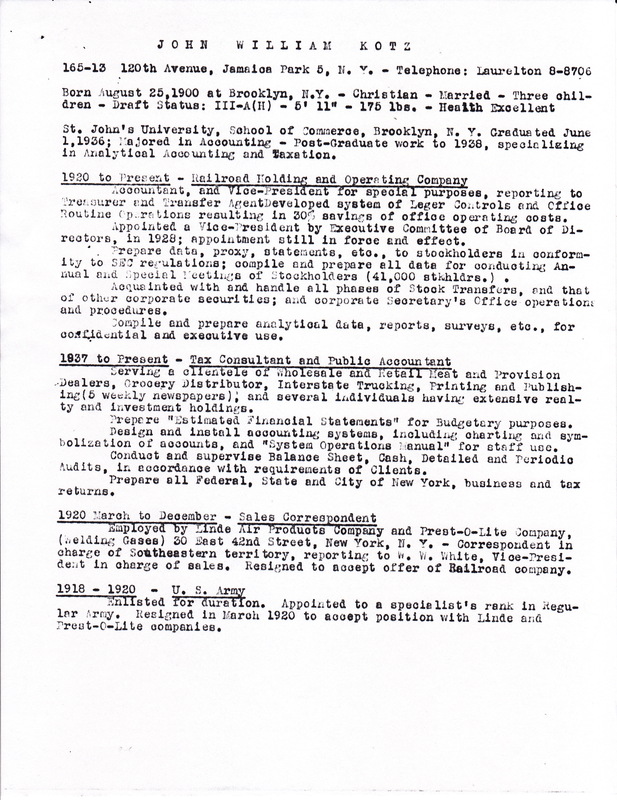 In addition to working for Southern Pacific, John started his own practice in 1937 as a Tax Consultant and Public Accountant. 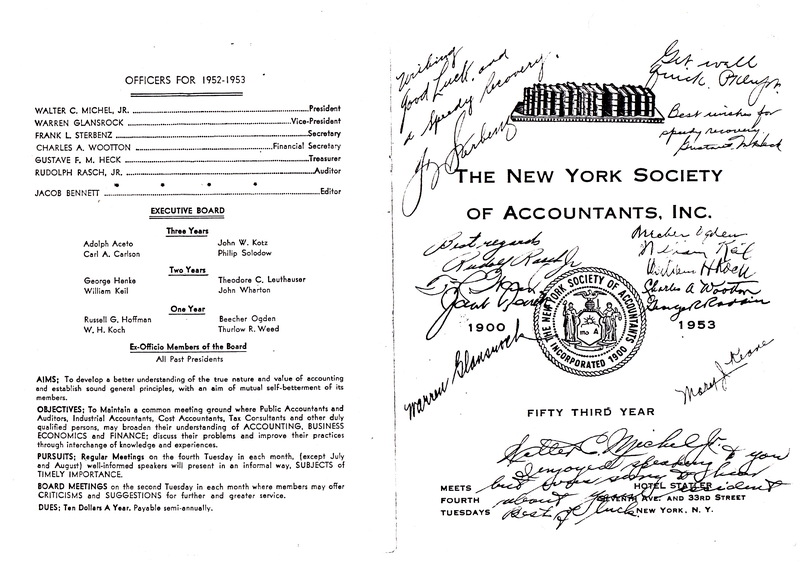 He was a member of the New York Society of Accountants and was on the Executive Board for at least three years, probably longer. 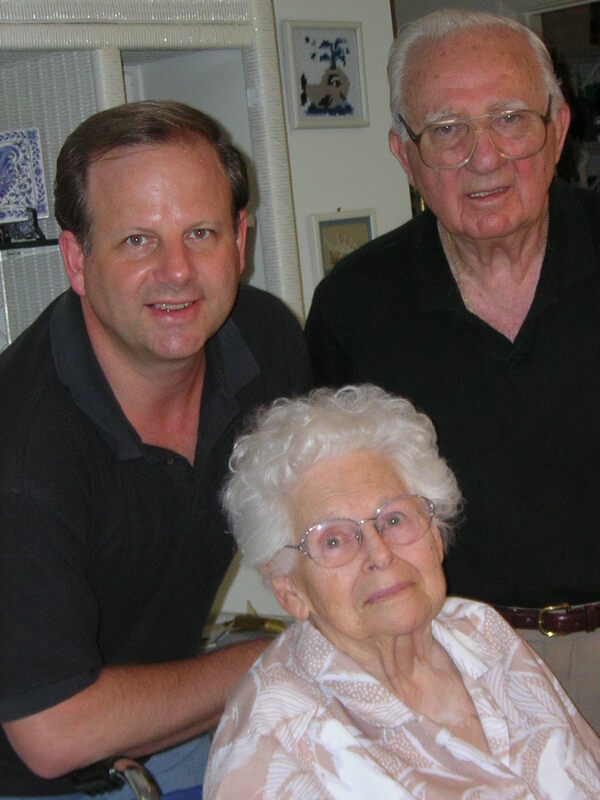 After WWII was over, Nonnie and Poppie bought a house together with Grandpa Kotz in Millburn, NJ where they lived together for about four years. 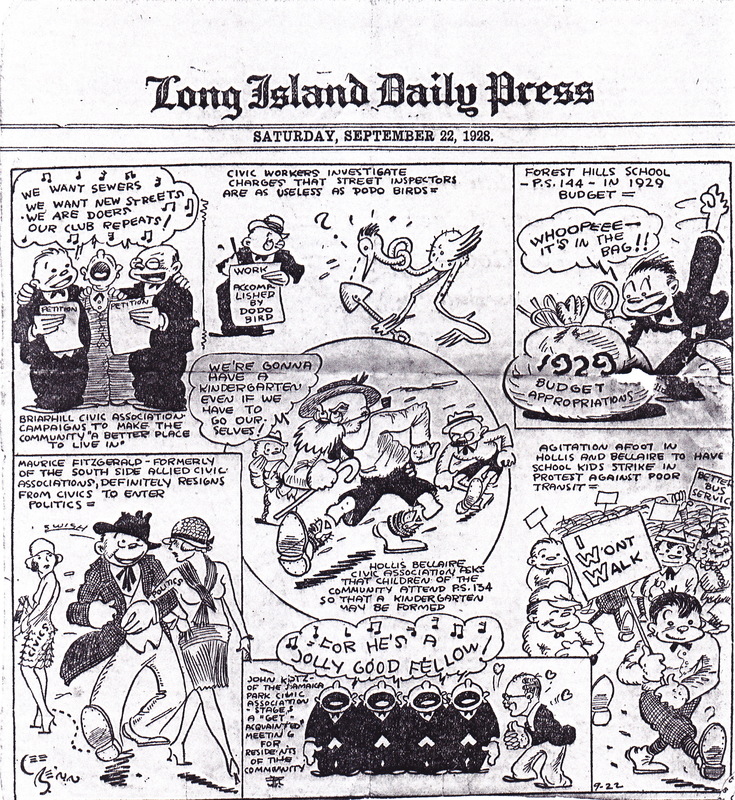 After that, Nonnie and Poppie moved to Springfield and Grandpa Kotz moved back to Long Island, having bought a place in Merrick, NY for a little over $14,000. Can you imagine? You can’t even buy a doghouse these days for that kind of money. And it was a nice place in a very good area. Below is a picture of John taken around 1960. John’s wife, your Great-grandmother Esther Adele passed away in the 1950s. He eventually got remarried to Mae Valusi, my step-grandmother. Here is a picture of them taken around 1970. 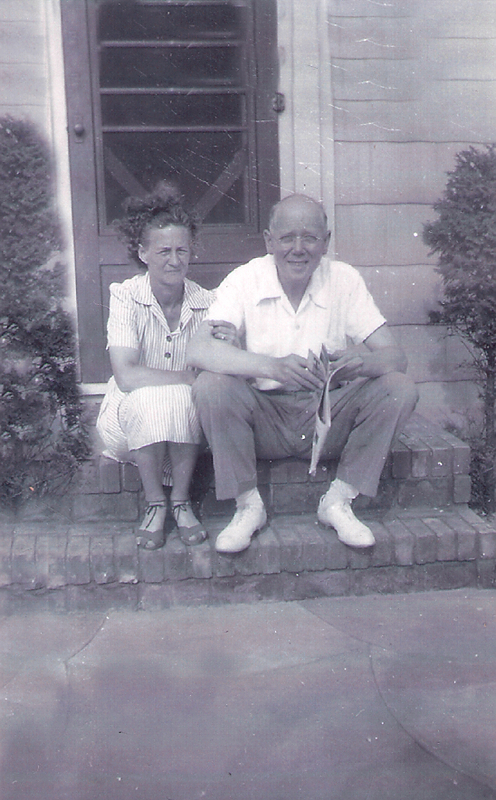 John and his second wife Mae lived happily in Merrick for many years. After Mae passed away, John moved to Lake Worth, Florida. 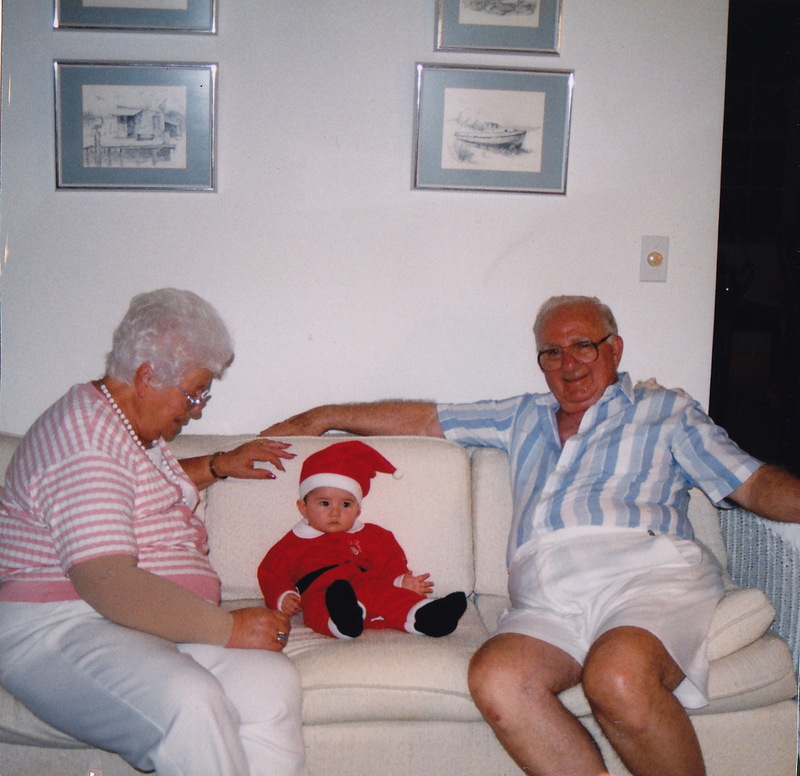 While Poppie was still working Nonnie looked after Grandpa Kotz when he got older, while Poppie shuttled back and forth between their homes in Red Bank, NJ and Boynton Beach, Fla.
One thing I recall about Grandpa Kotz was that he was very conservative and quite the traditionalist. I remember back in the 1960s when they started introducing folk music and guitars into Catholic church services he would grumble during Sunday mass and say,” I don’t approve of these hootenanny masses.” (A hootenanny is kind of a folk music jam session.) Funny. John Kotz remained active throughout his whole life. He liked to play golf regularly and did so into his late-eighties. 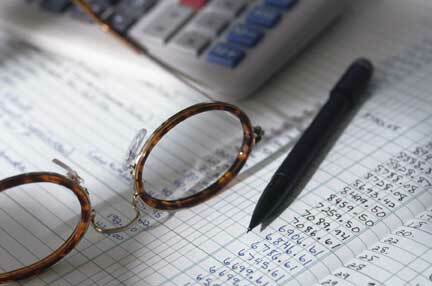 He also continued servicing his accounting clients (including Nonnie and Poppie) as his mind remained as sharp as ever. Interestingly, Grandpa Kotz, who smoked Parliament cigarettes I remember, quit smoking in his early-eighties after smoking his whole life. Who does that? LOL That’s a man with a strong will. Doing so likely added several years to his life, and although he experienced some respiratory difficulties towards the end of his life, Grandpa Kotz lived to the ripe old age of 93. John lived a long and healthy life and outlived two wives. In his late eighties and early nineties he even had a girlfriend in Florida (can’t recall her name) and may have been contemplating getting married a third time. John W. Kotz passed away peacefully in his sleep, in his easy chair, at his home in Lake Worth, Florida, on February 11, 1994. Esther Adele Johnson was born in Brooklyn, New York on September 5, 1896. Esther had three brothers, Gustave, George, and Karl, and one sister, Edith. 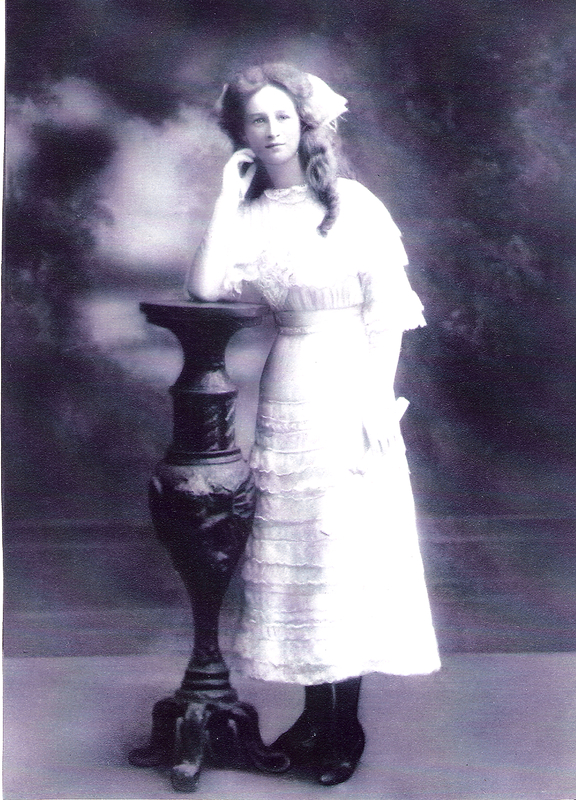 Below is a picture of Esther from 1911 when she was just 15 years old. I don’t know that much about Esther, actually, but I do have some interesting details. First, Esther had been married before John W. Kotz (she was four years older than John) to a Harold Coakley, Mess Sergeant, Company F, 69th N.Y. Regiment, U.S. Army. 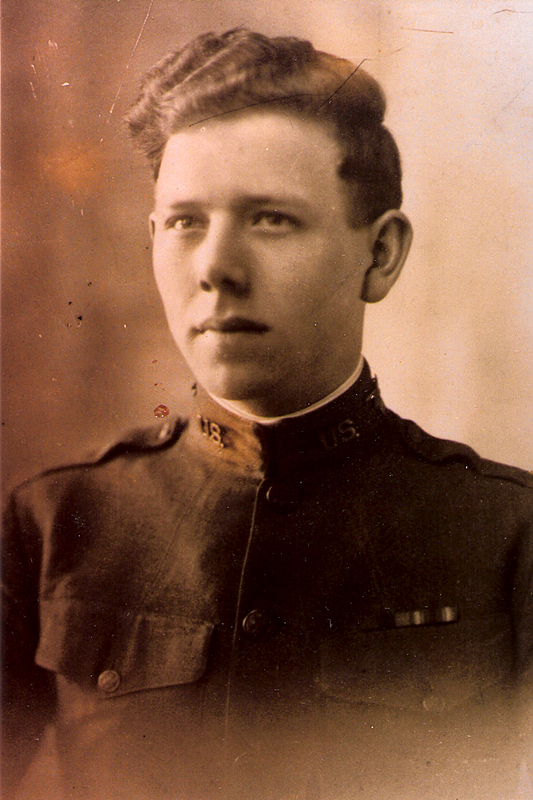 Harold, however, was killed in action the day after Armistice Day, November 11, 1918, when Esther was just 22 years old. 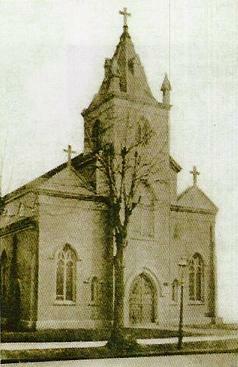 Two years later, on October 2, 1920, she married John W. Kotz at the St. Mary Magdalene’s Church in Springfield Gardens. Unfortunately, the church burned down in a fire just last year in 2010 so I can’t provide any good images. There is one of the church in the PDF below taken just as the fire fighters arrived. 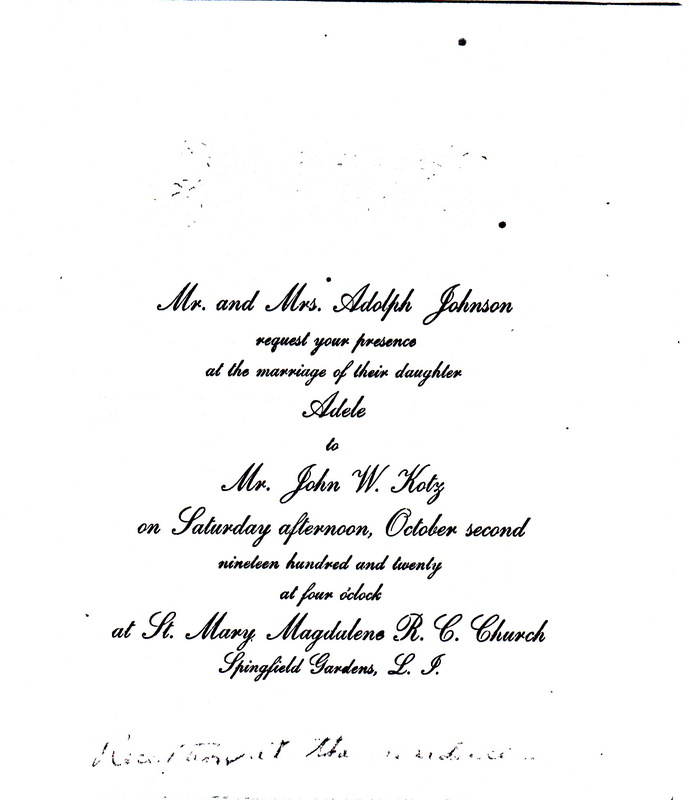 Here is one of the invitations to Esther and John’s wedding. And below is a newspaper clipping describing the church service and reception afterward. The second interesting point about Esther, and regarding our family history, is that the Johnson family were Swedish Lutherans, and she either had to or was asked to convert to the Roman Catholic religion. (Nowadays, Roman Catholics can get a special Papal Disposition [permission from the Pope] to marry a non-Catholic.) Esther apparently took to Catholicism, in any event, and was a parishioner the Curé of Ars Roman Catholic Church in Merrick, New York. Below is a picture of Esther Adele in her early twenties alongside her mother, Anna Ingaborg Johnson, nee von Bitzen. I don’t know much more about Esther Adele, actually, except for the fact that she died relatively young (especially for our family). Esther passed away in her late-fifties or early sixties, for sure she died before I was born. This must have hurt Nonnie very deeply because she was very close to her mother and all her relatives in the Johnson family. Nonnie didn’t talk much about her when I was young, however, probably not wanting to discuss the subject.. I neglected to ask Nonnie about the date and specific details of Esther’s death, regrettably. 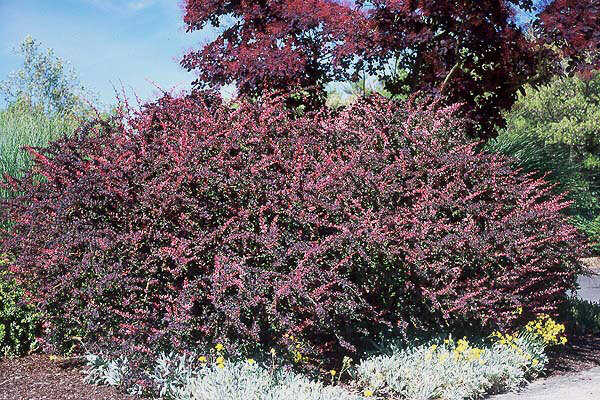 (I can get that information at the cemetery and through public records, i.e., death certificate.) I do know from a letter I have from Grandpa Kotz that just shy of her 50th birthday she suffered a stroke on August 19, 1946. 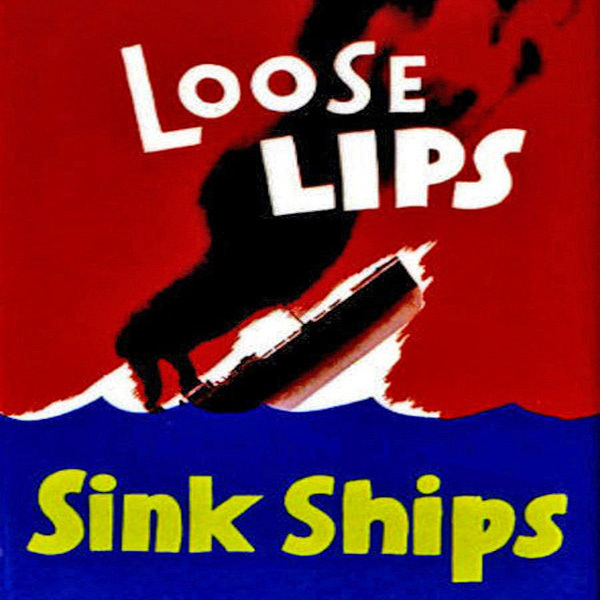 I seem to recall Nonnie telling me she had Leukemia, but I’d have to check on that to be certain. 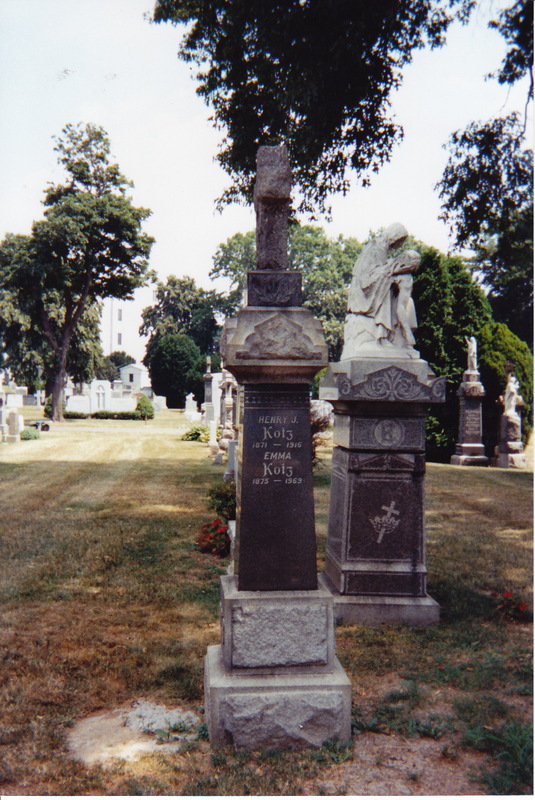 Both John William Kotz and Esther Adele Kotz, nee Johnson are buried at St. John’s Cemetery, 8001 Metropolitan Ave., Middle Village, N.Y. 11379. 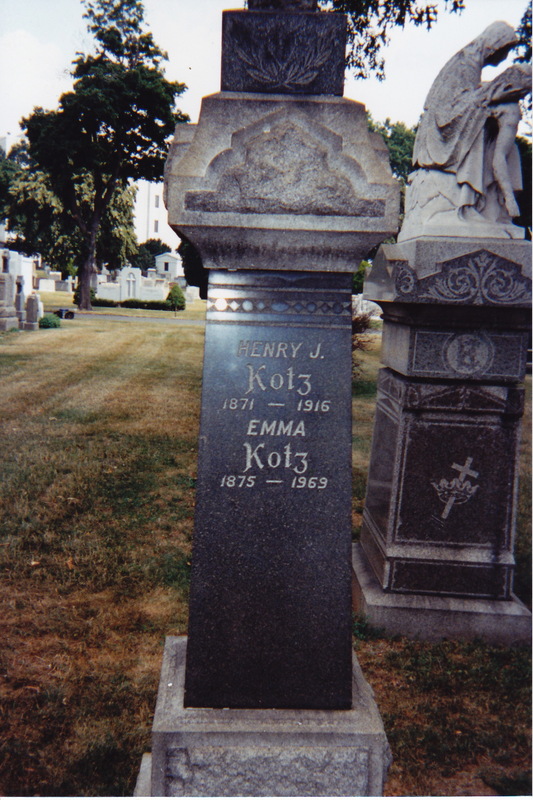 Henry (“Harry”) John Kotz was the son of Robert John Kotz and Barabara Kotz, nee Boening, and the father of John William Kotz. He was Nonnie’s father’s father. 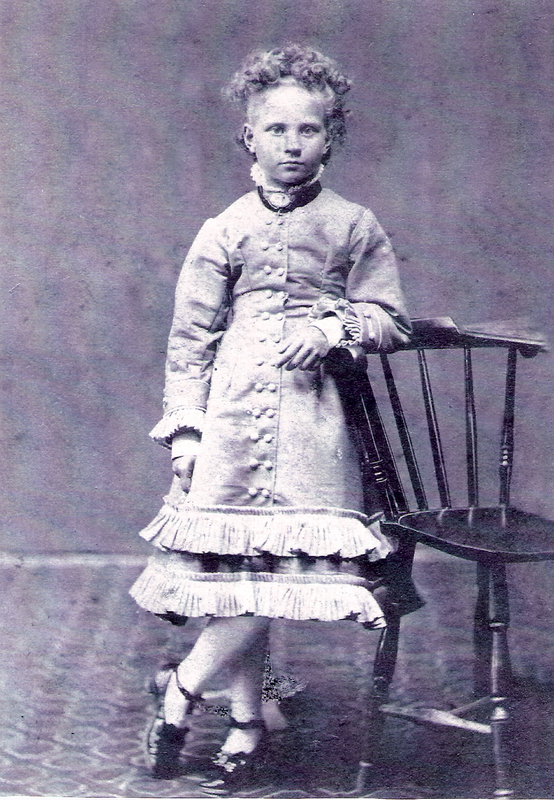 Emma Kotz, nee Reis was the daughter of Michael Anthony Reis and Margaretha Reis, nee Bitzermann. She was Nonnie’s father’s mother. 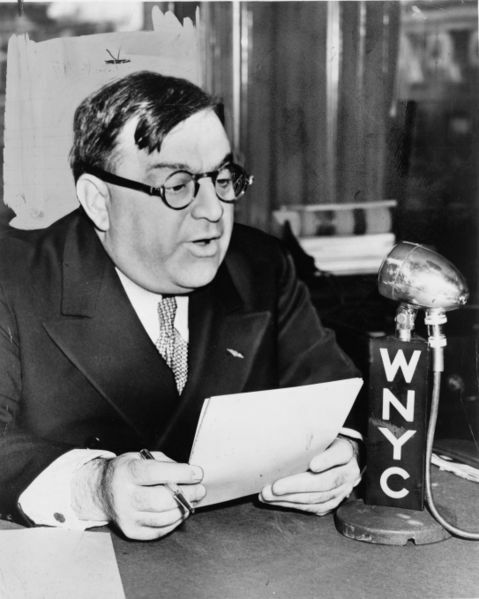 Henry, or Harry as he was called, was the first Kotz born in the United States, in Brooklyn, New York. He was a piano builder for the Steinway Company in Long Island, New York. 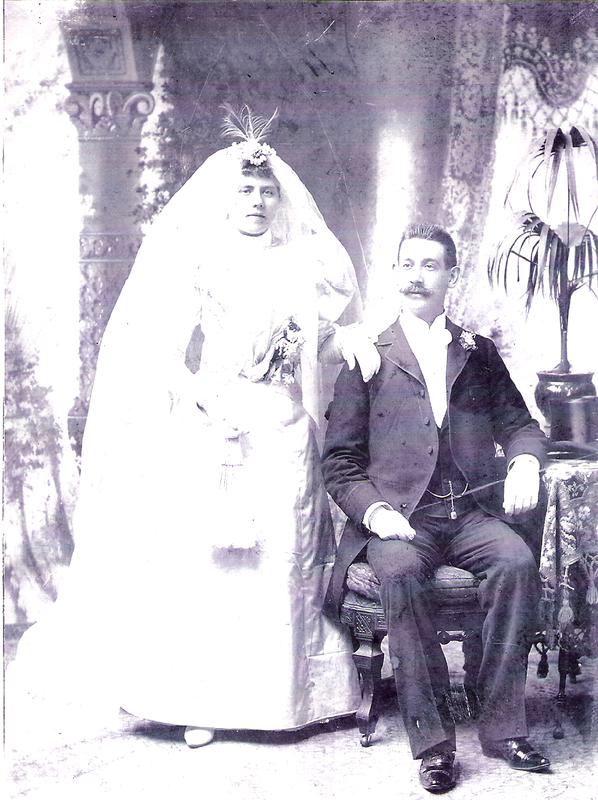 Harry married Emma Kotz, nee Reis on January 6, 1897 at Our Lady of Sorrows Roman Catholic Church, 103 Pitt Street, New York. Harry and Emma had six children: John William (your great-grandfather), born August 25, 1900; Margaret, born March 25, 1903; Harry Anthony, born Jan. 15, 1905; Aloysius, born Jan. 3, 1909; Anna, born Oct. 21, 1910; and Elizabeth, born Sep. 12, 1912. 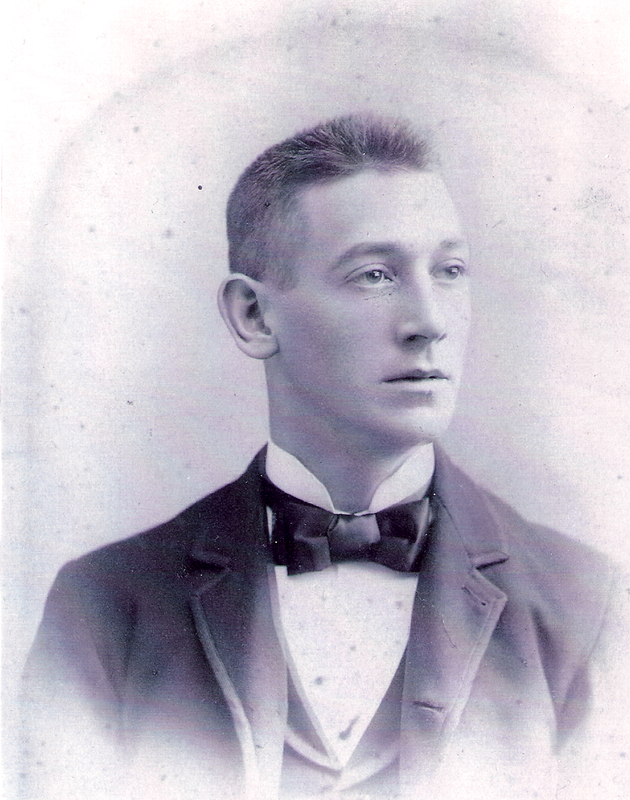 Henry “Harry” John Kotz passed away on Dec. 26, 1916 at the young age of 45. Emma Reis was born on Long Island, New York on Feb. 10, 1875. 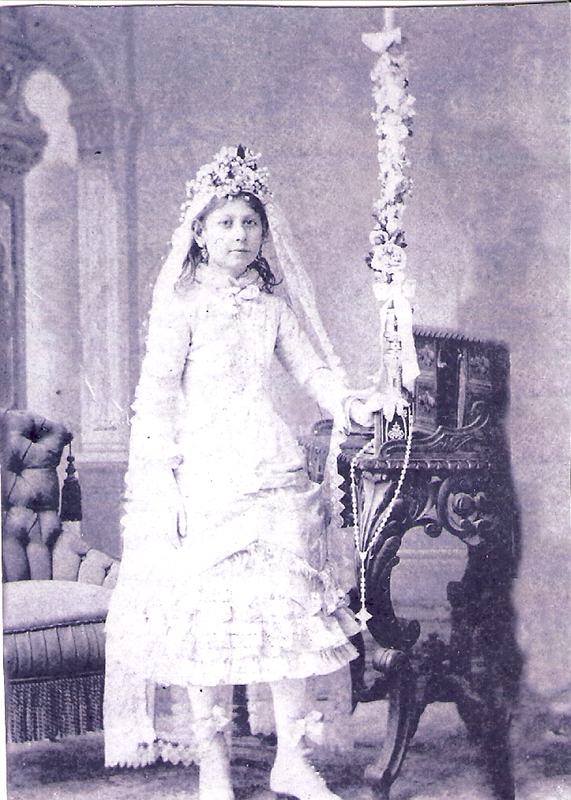 Below is her Roman Catholic Confirmation photograph in which she would have been around 13 years old, so from around 1888. 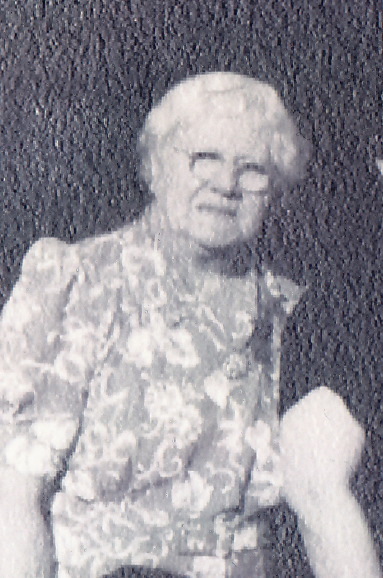 And finally, here’s one of Emma as an elderly woman, probably around 1965 or so when she would have been around 90 years old. 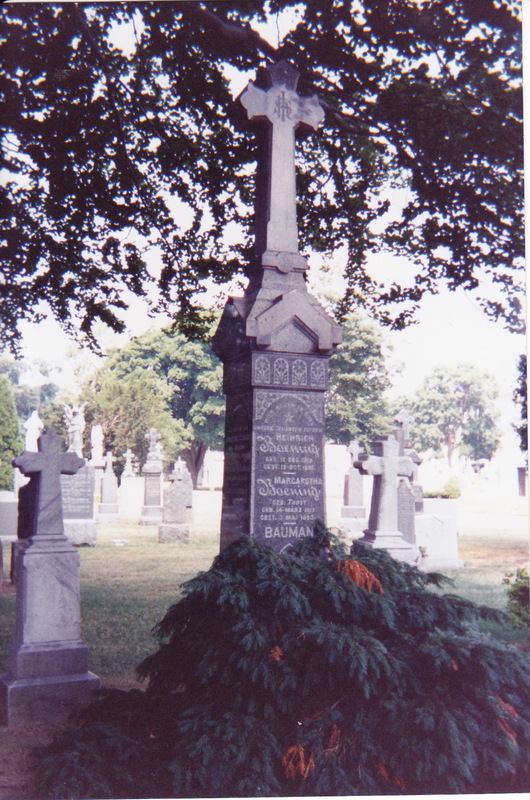 Both Henry John Kotz and Emma Kotz, nee Reis are buried in a shared plot at St. John Cemetery in Middle Village, N.Y.
Adolph was the son of Johanssen Johnson and First Name Unknown Johnson, nee Truesson, and the father of Esther Adele Kotz, nee Johnson. He was Nonnie’s mother’s father. Anna’s parents are not known at this point. She is the mother of Esther Adele Kotz, nee Johnson. She is Nonnie’s mother’s mother. 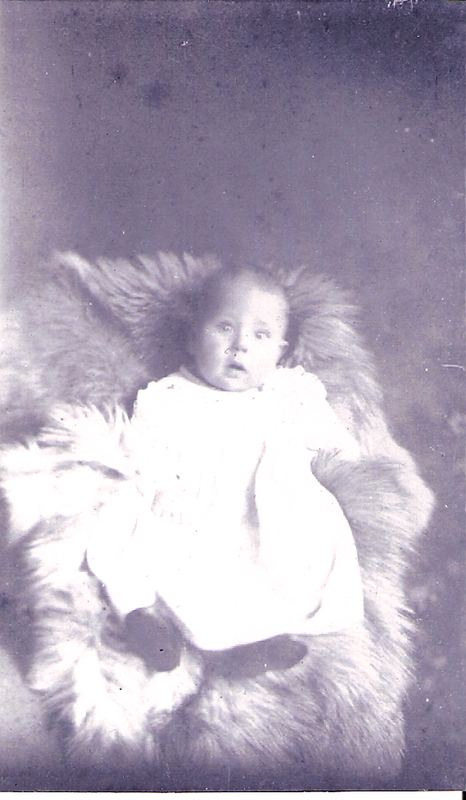 Adolph Gustav Johnson was born in 1865 in Sweden (Nonnie says he was probably from Goteborg). 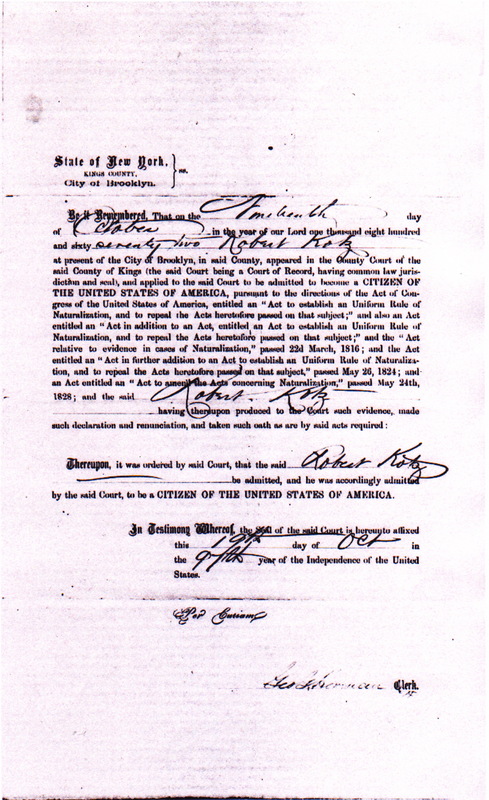 His death certificate shows that he emigrated to the United States in 1881 at the age of 16 (with or without parents I don’t know). 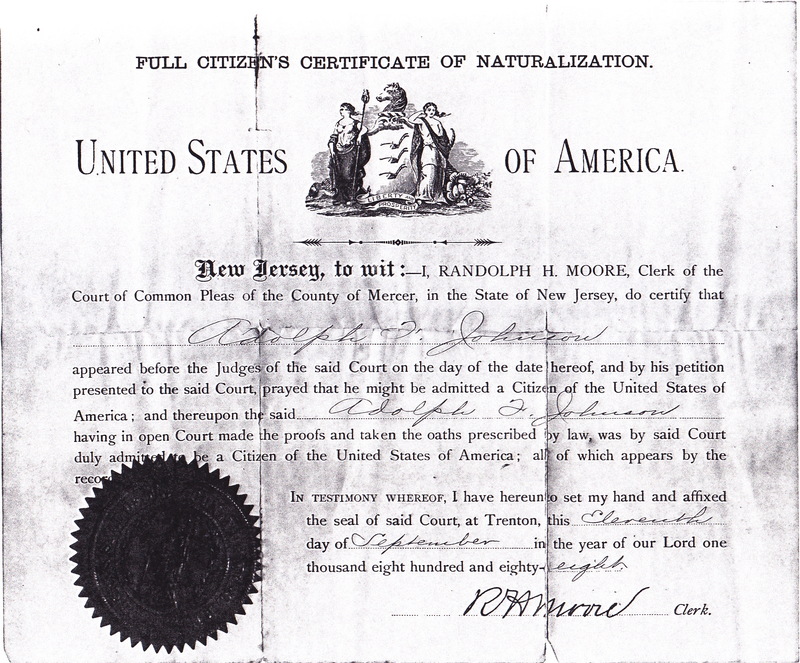 He became a citizen of the United States on September 11, 1888 at the age of 23. 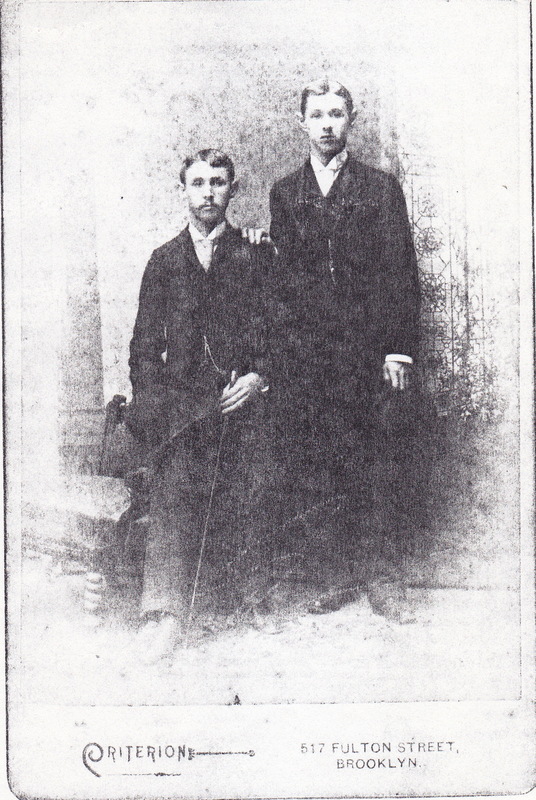 This is a picture of Adolph (right) and his brother (name unknown) which appears to have been taken in Brooklyn, New York shortly after his arrival in America. 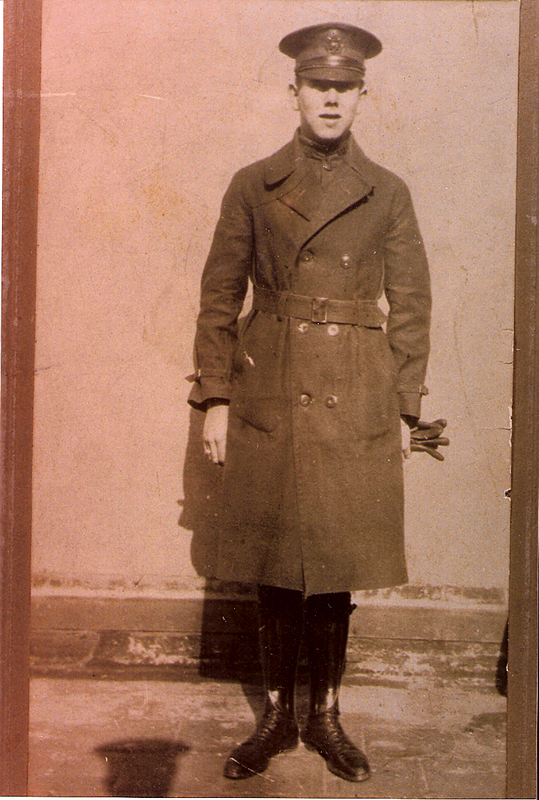 Here’s another picture of Adolph as a man in his late twenties or early thirties. 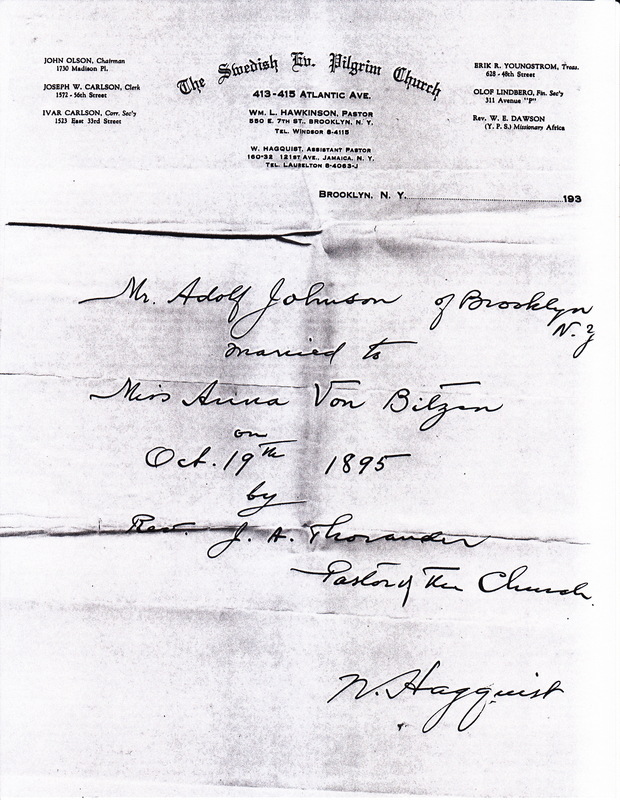 On October 19, 1895, Adolph married Anna Ingaborg von Bitzen at the Swedish Evangelical Pilgrim Church on Atlantic Avenue in Brooklyn, New York. 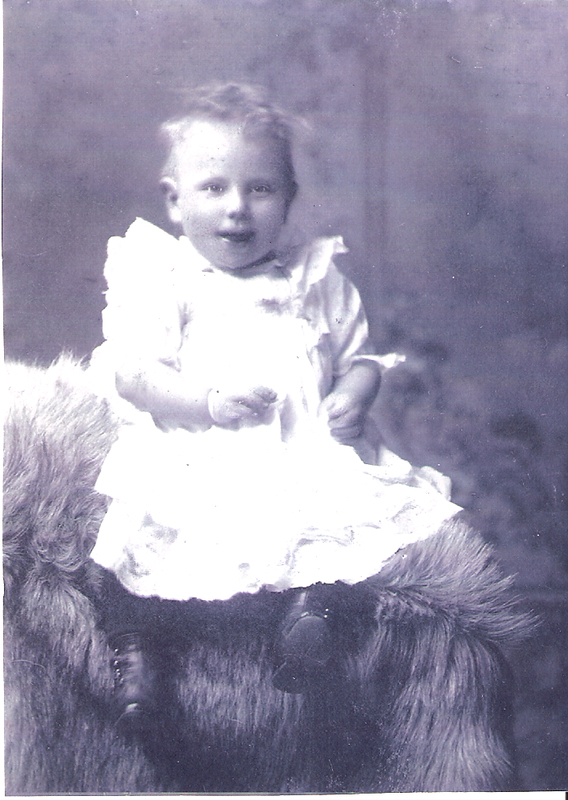 On September 13, 1925, Adolph passed away at the age of 60 due to cerebral apoplexy (stroke) at his home at 137-21 218th Street, Springfield Gardens (Queens), N.Y.
Anna Ingaborg von Bitzen was born in Goteborg, Sweden on June 28, 1872. The stamps indicate that the document was issued in Goteborg, ans she most likely sailed out of there. 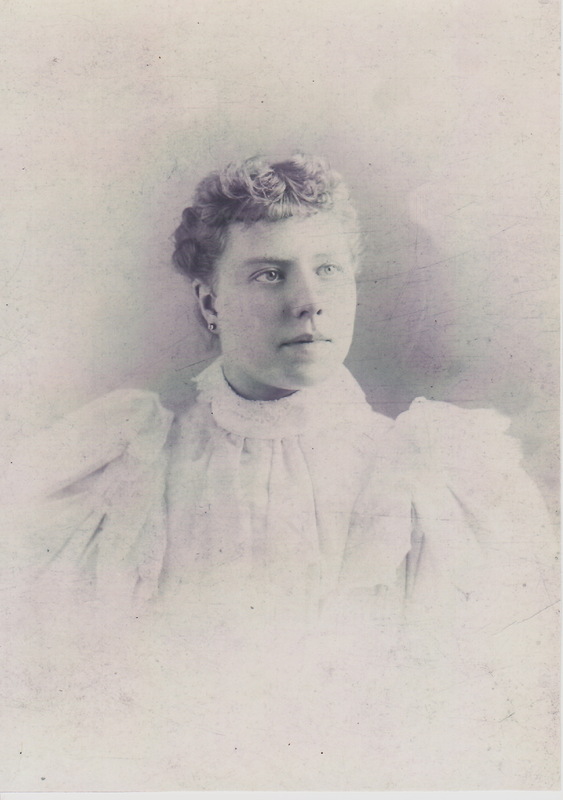 Anna had at least three sisters I know of: Inez, Worhel, and Jennie Jensen (a half-sister, actually). Interestingly, I have two pictures of the sisters together at different ages. 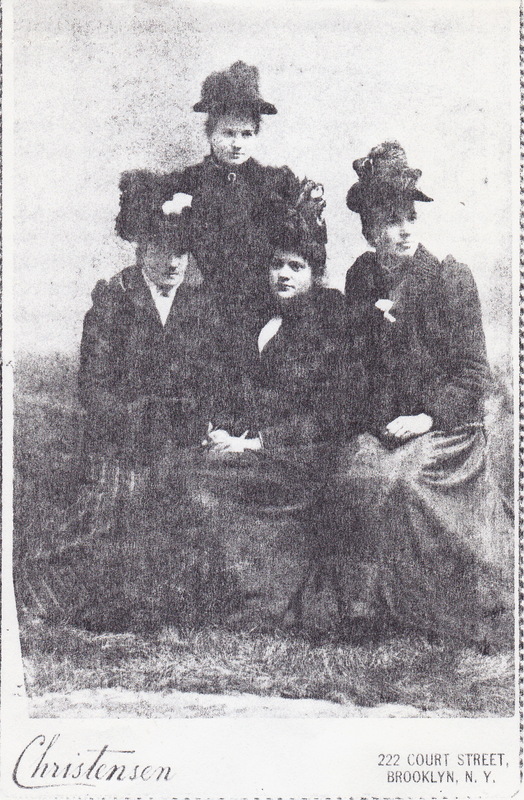 The first picture below is one of the sisters as young women (Seated, left to right are Jennie Jensen, Worhel, Inez; standing is Anna). 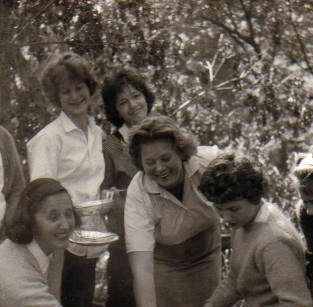 The second is a picture of the sisters in late middle-age (From left to right: Jennie Jensen, Anna, Inez, Worhel). 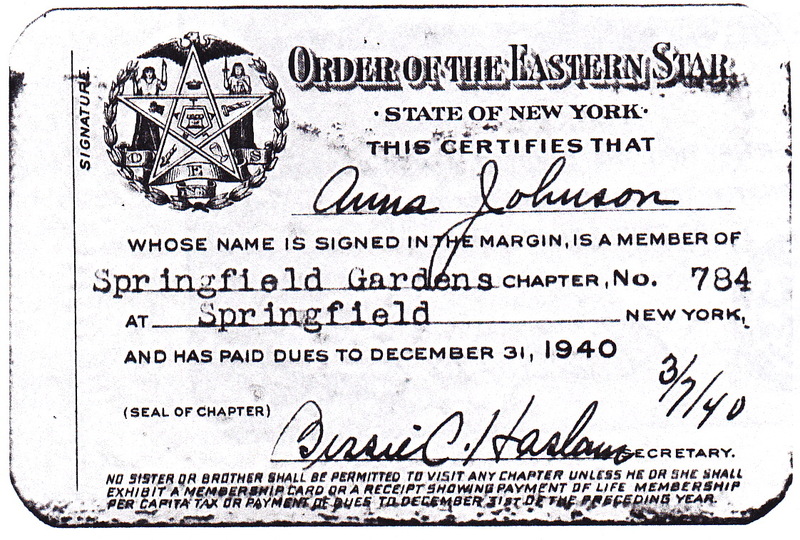 Anna was a member from at least 1938 through 1940 of an organization called the Order of the Eastern Star. In order to join this organization, one of your male relatives must be a Fremason and sponsor you. A friend of mine who is a Freemason offered to see what information he could get from the OES (Order of the Eastern Star) lodge. 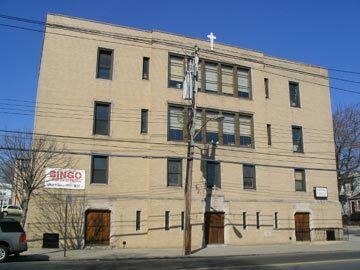 The Springfield Gardens, N.Y., Chapter is no longer active, but he was able to find out through the mother organization that her Masonic sponsor was K.W. 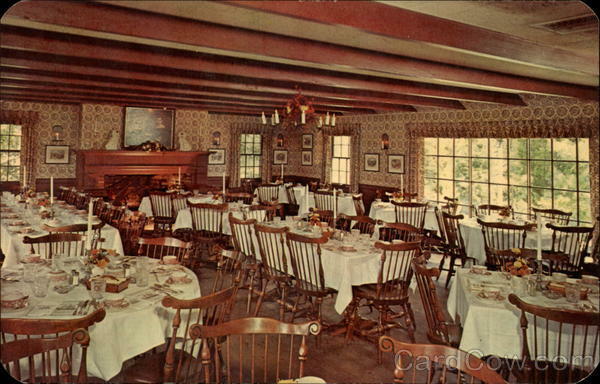 Johnson of the Plymouth Lodge 1004, Brooklynn, N.Y. (K.W. 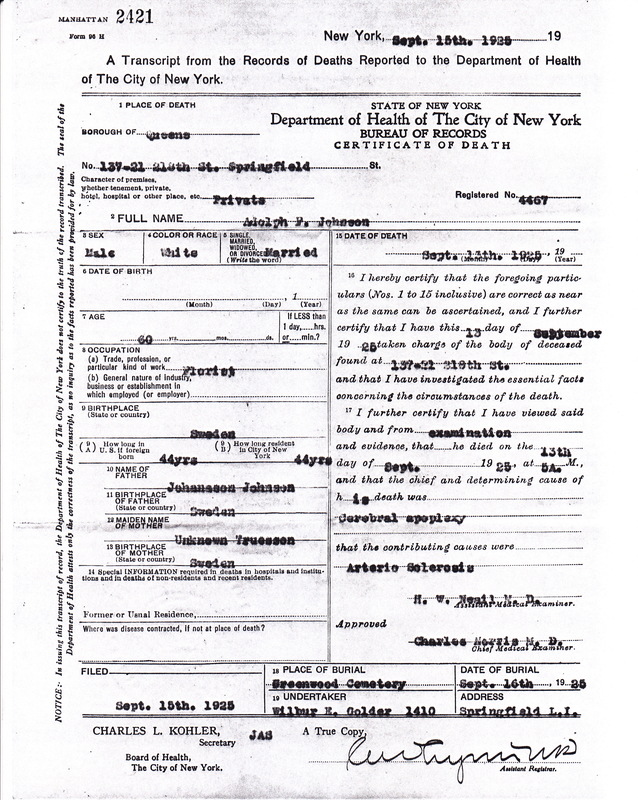 Johnson was Karl Johnson, Esther Adele Kotz, nee Johnson’s — Nonnie’s mother’s — sister.) The interesting thing is the question of involvement by members of the Johnson family. Anna is from Sweden, and the Swedish rites of Freemasonry generally counted nobility among its members, especially in the earlier years. This connection to Freemasonry, then, is important in that Anna was descended from nobility. Her (our) ancestor was Christof Beetz, an Imperial Knight of the Holy Roman Empire [ennobled by Emperor Charles VI as “Beetz von Beetzen”] (see end of this narrative.) Nonnie always talked about this “Beetz von Beetzen,” and had the Beetzen coat of arms hanging on the wall of her study in Florida. Anna’s maiden name was von Bitzen, an alternate spelling of von Beetzen. (In German personal names, von is a preposition which approximately means of or from and denotes nobility.) You can read about Beetz below, but the important thing is that his title passes to all his descendants, male and female, “to infinity,”, meaning that you and I, through Anna Ingaborg von Bitzen, are not only descended from nobility, but in fact are technically nobles ourselves. What do you think of that? Anna apparently maintained her connections with the old country, as I know that, when she was 65 years old, she and her sister Inez Slandorf, nee von Bitzen traveled back to Goteborg, Sweden on at least one occasion via ocean liner. 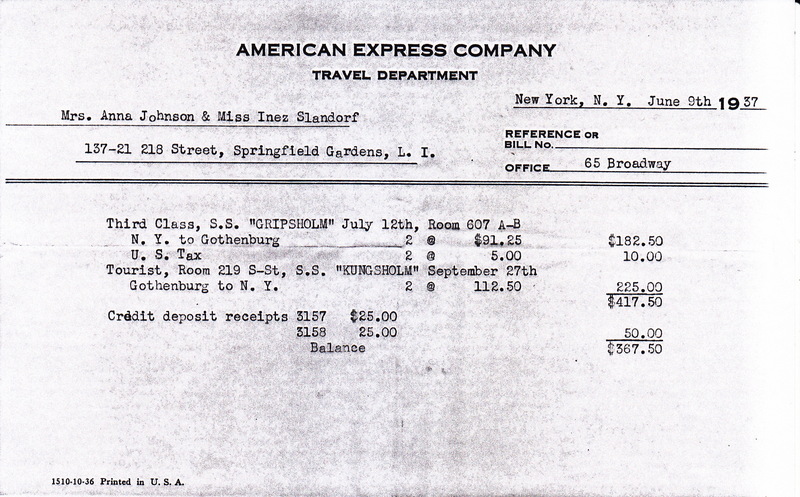 Records show that she booked passage through the American Express Company on a round-trip to Goteborg, Sweden (spelled Gothenburg on the receipt). Anna and Inez traveled to Goteborg on the S.S. Gripsoholm on July 12, 1937. 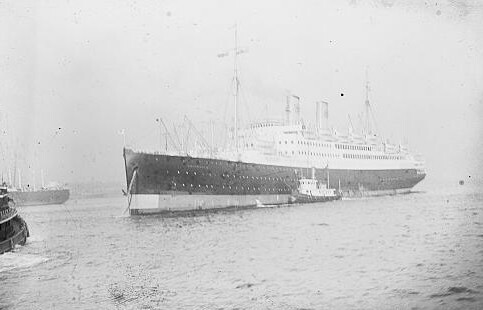 The sisters returned to New York on the S.S. Kungsholm on Sep. 27 of the same year. This trip two-and-a-half month long trip must have been a great adventure for Anna and Inez, and I’m sure they were elated to once again return to their home country and visit again with family and perhaps childhood friends. Adolph and Anna had five children: Esther Adele (your great-great-grandmother), Gustave, Edith, George, and Karl. 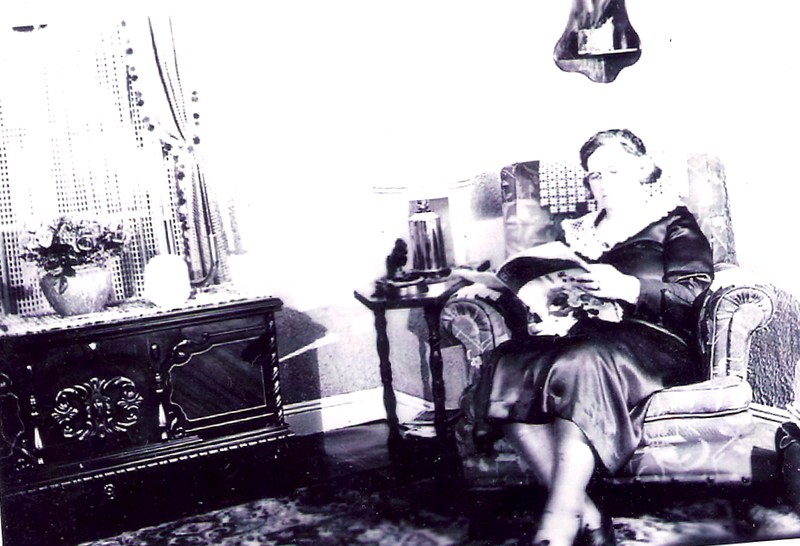 I never met my grandmother Esther Adele as she passed away before I was born. I knew “Uncle George” and remember going out to his and “Aunt Fay’s” house in the country in New Jersey to visit. I also remember meeting “Uncle Karl” at least once in my life, a fact I remember because he repaired my sled on one occasion after I cracked into a tree out at Uncle George and Aunt Fay’s house. Here’s a picture of Anna probably around the time of her trip to Sweden. Anna outlived her husband Adolph by 18 years. She passed away at the age of 71 on Oct. 31, 1943. Both Robert John and Barabara are of German descent. The names of Robert John Kotz’s parents are unknown at this point. Barbara Kotz, nee Boening is the daughter of Heinrich Boening and Margaretha Boening, nee Trost. 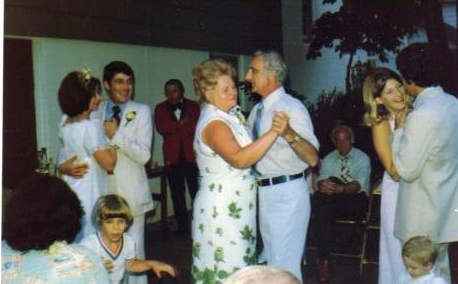 Robert John and Barbara Kotz were the parents of Henry John Kotz. Robert John was Nonnie’s father’s father’s father. Barbara was Nonnie’s father’s father’s mother. I also know that he attended a religious seminary school in his youth as I have a document (in German) to that effect. According to Nonnie, he was an organ master and music writer who helped organize the school system for the Roman Catholic Diocese of Brooklyn, New York. He was apparently traveling on horseback from one church to another in the Maspeth area in the Borough of Queens, N.Y.C. when the horse he was riding became startled by a rattlesnake, throwing him and causing his death. He died on Easter Sunday in 1884. Barbara Boening’s parents were born in Germany, but I don’t know whether or not she was, too. She may have emigrated with her parents to America, or she mat have been born in America. Robert and Barbara had three children: Henry, Margaret, and Katherine. 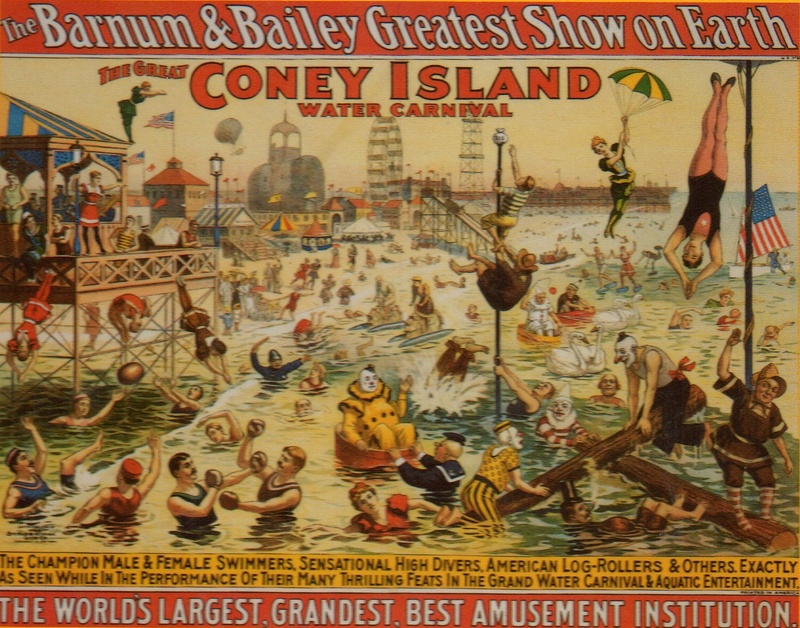 Below is a picture of Barbara taken at Coney Island, New York in 1905. 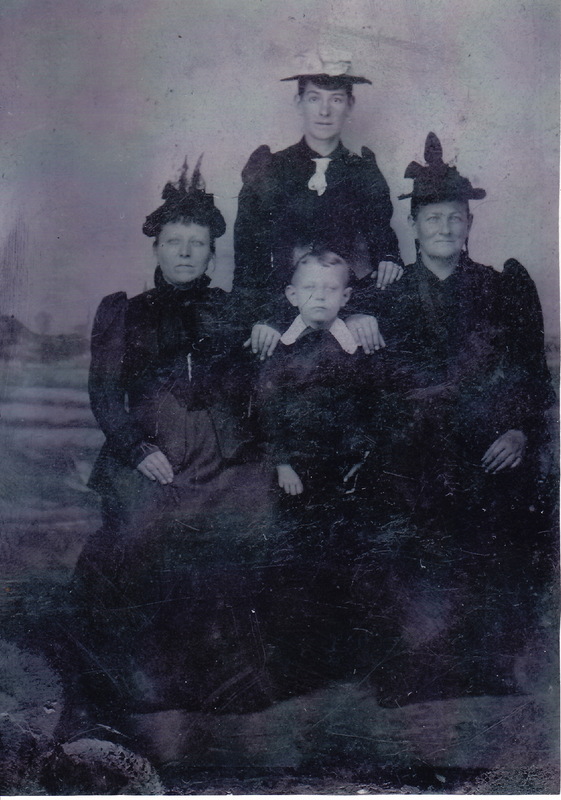 Pictured are Margareth Reis, nee Bitzermann (your great-great-great-grandmother — seated left), John William Kotz (your great-grandfather and Nonnie’s father — child standing in front), Barabara Kotz, nee Boening (your great-great-great-grandmother — seated right), and Katherine Kotz (Barabara Kotz’s sister and John William Kotz’s Roman Catholic Godmother — standing in back). 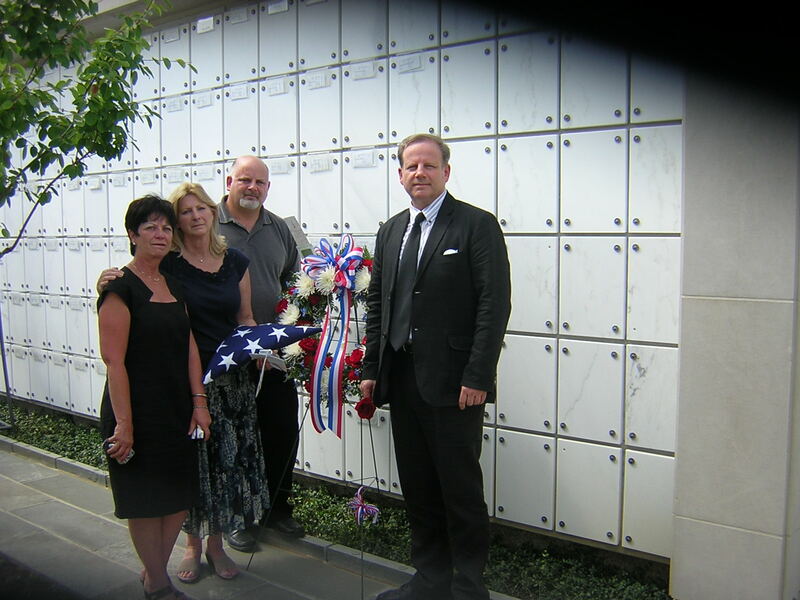 Both Robert John Kotz and Barabara Kotz, nee Boening are interred at St. John’s Cemetery, Middle Village, N.Y. The names of Michael Anthony Reis’s parents are unknown at this point. Margaretha Reis, nee Bitzermann is the daughter of Johan Wilhelm Bitzermann and his wife (name unknown). 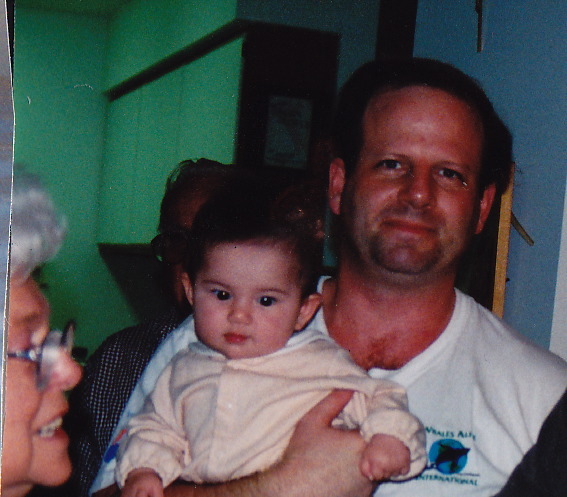 Michael Anthony and Margaretha were the parents of Emma Kotz, nee Reis. Michael Anthony was Nonnie’s father’s mother’s father. Margaretha was was Nonnie’s father’s mother’s mother. Michael Anthony Reis is thought to have come from Bavaria in Germany. According to Nonnie, he and his brother, Aloysius, helped form the BVD Underwear Company. Margaretha Bitzermann was also born in Germany and emigrated to the United States. Before marrying Michael Anthony Reis, Margaretha was apparently briefly married to a Civil War veteran, one Count Adam Begonski originally from Silesia, Poland, who led the 69th NY Regiment during the war as a Colonel. Begonski died soon after the marriage of war-related injuries and Margaretha subsequently remarried Michael Anthony. The couple had three children: Emma, Aloysius, and Carrie. 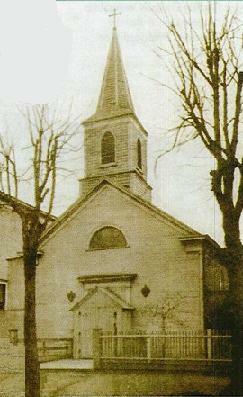 One thing I know about Margaretha is what Nonnie told me, that she “started” Saint Margaret’s Church in Middle Village. Based on her age, I would guess that she was talking about the 1907 rebuilding, and that perhaps Margaretha was involved in some way in the planning and/or financing of the building. 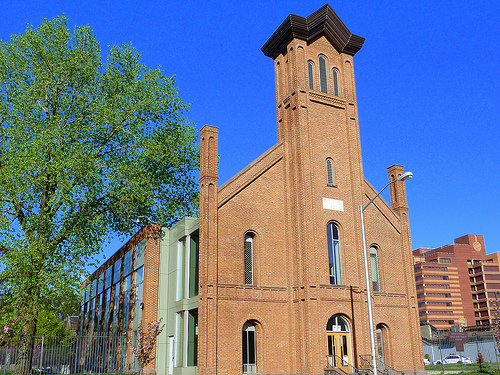 “The third version of the church was built in 1935.They decided on a rather efficient design the last time…the school is actually above the church, in the same building. The other thing Nonnie told me was that Margaretha owned the farm which would later become St. John’s Cemetery in Middle Village. This fits in with the fact that St. Margaret was the patron saint of farmers. 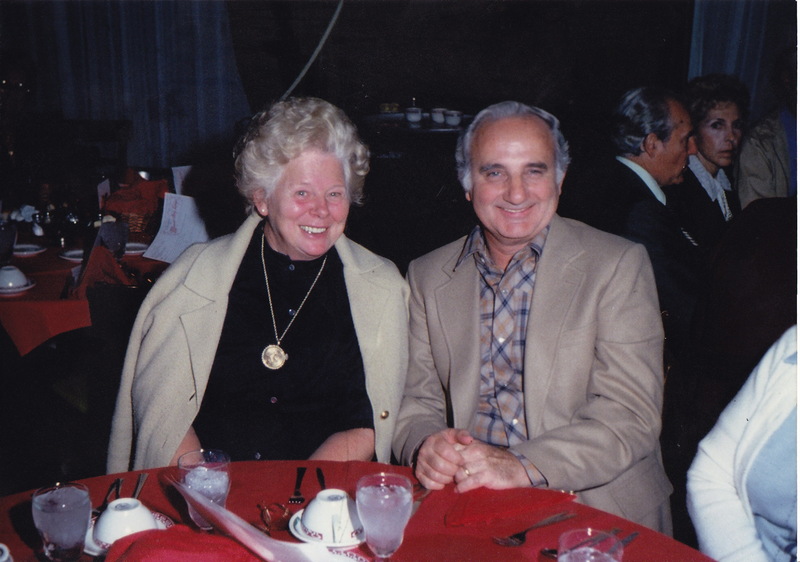 In any event, it would appear Michael Anthony and Margaretha Bitzermann Reis had some property and assets, and were active in the church and perhaps influential in the local community. 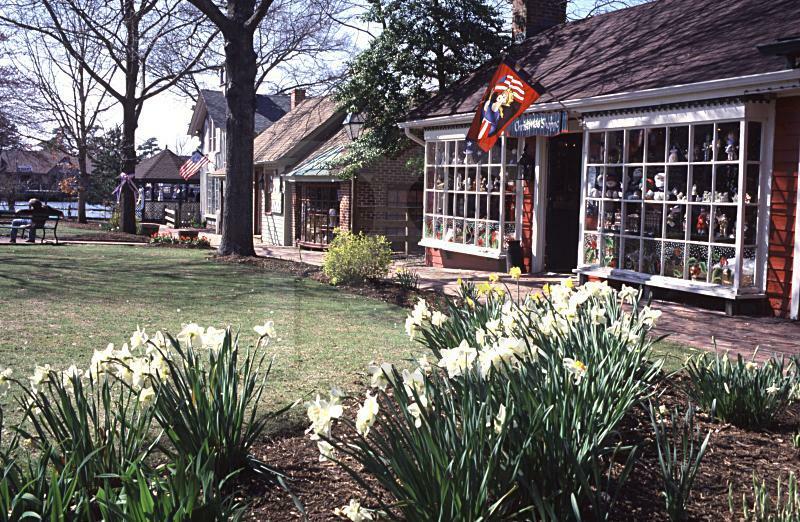 As either Michael Anthony or Margaretha owned the farm which would later become St. John’s Cemetery in Middle Village, it is likely the two are interred there, but I would have to confirm that. The names of Johanssen Johnson’s parents are unknown at this point. 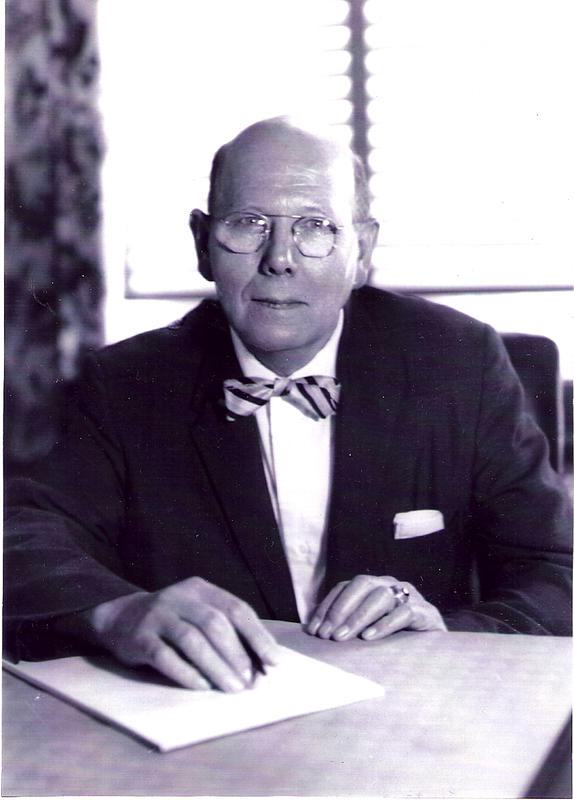 Johanssen was the father of Adolph Gustav Johnson. He was Nonnie’s mother’s father’s father. His wife (first name unknown; maiden name Truessen) was Adolph’s mother and Nonnie’s mother’s father’s mother. Nothing is known about these ancestors except for the fact that they were from Goteborg, Sweden. 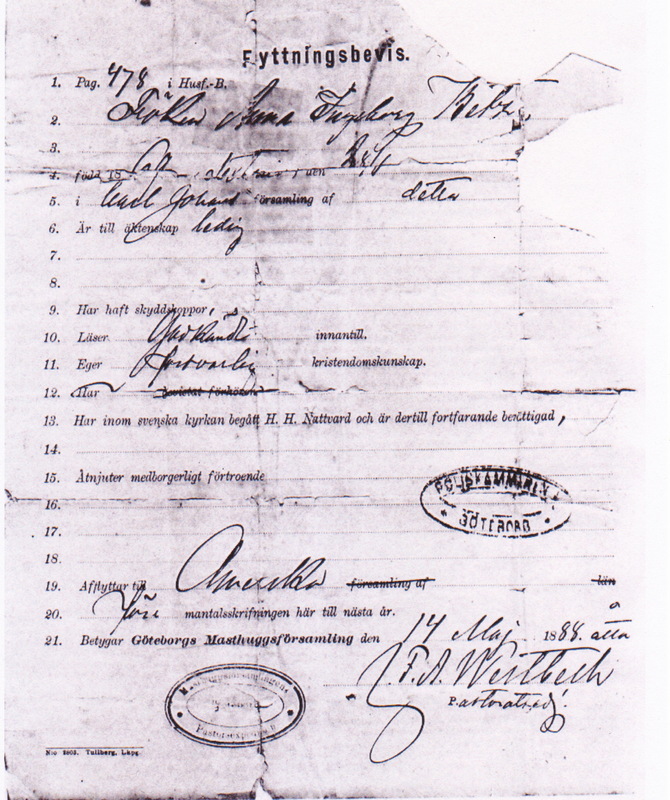 Both of their names were obtained from Adolph Gustav’s death certificate. Heinrich Boening and Margaretha Boening, nee Trost were the parents of Barbara Kotz, nee Boening. Heinrich was Nonnie’s father’s father’s mother’s father. Margaretha was Nonnie’s father father’s mother’s mother. I really don’t know anything about these ancestors except for the fact that they were born in Germany and emigrated to America, and that they are the parents of Barbara Kotz, nee Boening. I believe they may have been the first of all of our ancestors that I can identify by name to have come to the New World, so at least one branch of our family may have arrived in America as early as the 1830s or 1840s. 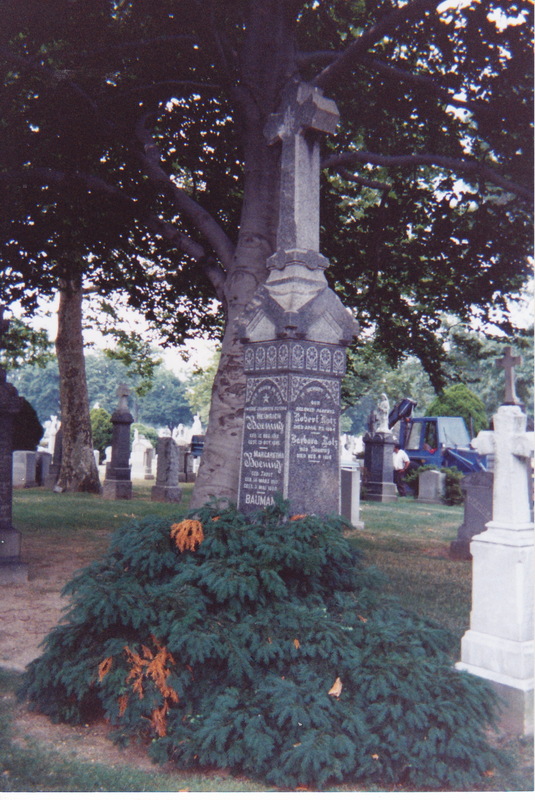 Both are interred at St. John’s Cemetery in Middle Village, N.Y., at the same family grave site as Robert John Kotz and his wife Barbara Kotz, nee Boening (Heinrich and Margaretha’s daughter). 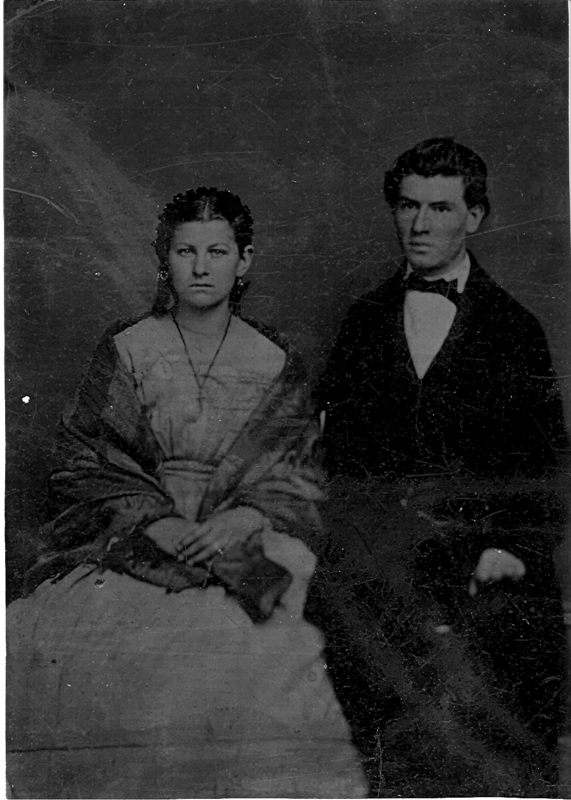 Johan Wilhelm Bitzermann and his wife (name unknown) were the parents of Margaretha Reis, nee Bitzermann, your great-great-great-grandmother, who emigrated to America in the early to mid 1800s. Johann Wilhelm was Nonnie’s father’s mother’s mother’s father. The only thing I know of Johann is that he was, according to Nonnie, the Supreme Station Master of the railroad station in the town of Bremmerhaven, Germany. Here is a painting of the station which was built in 1862. I have no information about his wife, unfortunately. Christoph Beetz is our ancestor through your great-great-grandmother Ann Ingaborg von Bitzen of Sweden. “Christoph Beetz (May 1, 1670, Swedish Pomerania – April 18, 1746, Straslund) was ennobled by Emperor Charles VI in Vienna, Austria on 27 January 1734 as “Beez von Beezen” (Beetz von Beetzen) after receiving an heritable membership of the old class of the Holy Roman Empire (higher nobility). His military career is highlighted by his command of a regiment at the age of 20 and his final appointment as Swedish Platz-Major and Stabs-Major of the military garrison in Stralsund. He was ranked as a Stadt-General. 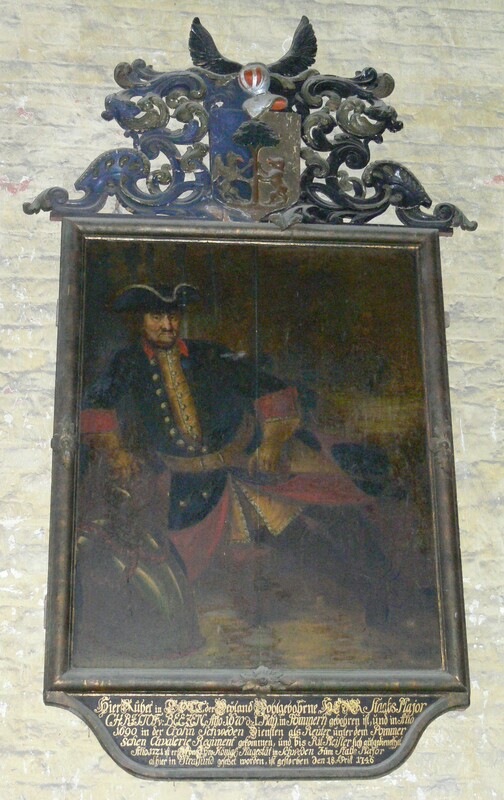 His 1746 portrait still graces the interior of Saint Mary’s Church, Stralsund, Germany (German: Kirche St. Marien zu Stralsund) where he is buried. 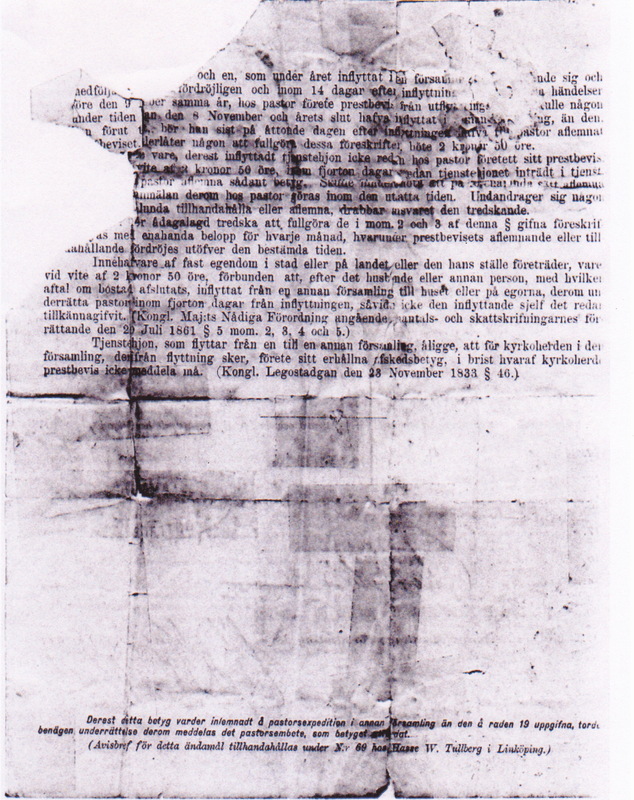 “According to the letters patent of January 27, 1734, now in the Österreichishes Staatsarchiv in Vienna, the nobility and the title Knight of the Holy Roman Empire (Reichsritter) is inherited by “all his present and future legitimate posterity, and their heirs’ heirs, men and women in descending line, in infinity” (‘Ihn sambt allen seinem jezigen und künftigen ehelichen Leibs-Erben und derenselben Erbens-Erben, Mann- und Weibs-Personen, absteigenden Stammens’). 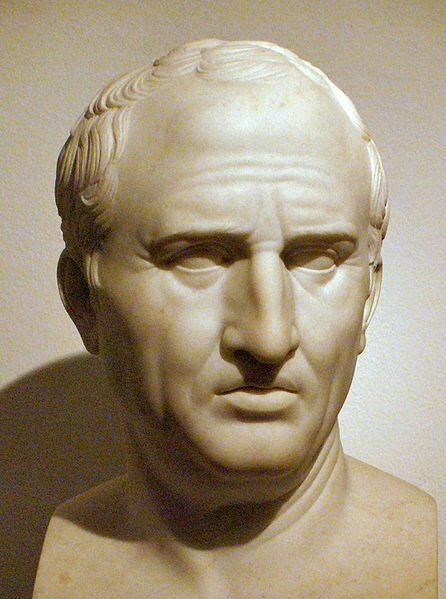 According to Codex Austriacus (ed. Herrenleben, S.G., Wien 1748, pars III, Suppl. I, 1720, page 953, 954) both daughters and sons inherited in Austria after 1720, so the reference “all his present and future legitimate posterity, and their heirs’ heirs” refer, according to Austrian law at the time, to both men and women when the letters patent was issued in 1734. This was also understood and underlined by the addition “men and women in descending line in infinity”. This pattern for hereditary nobility is called ‘cognatic succession’. 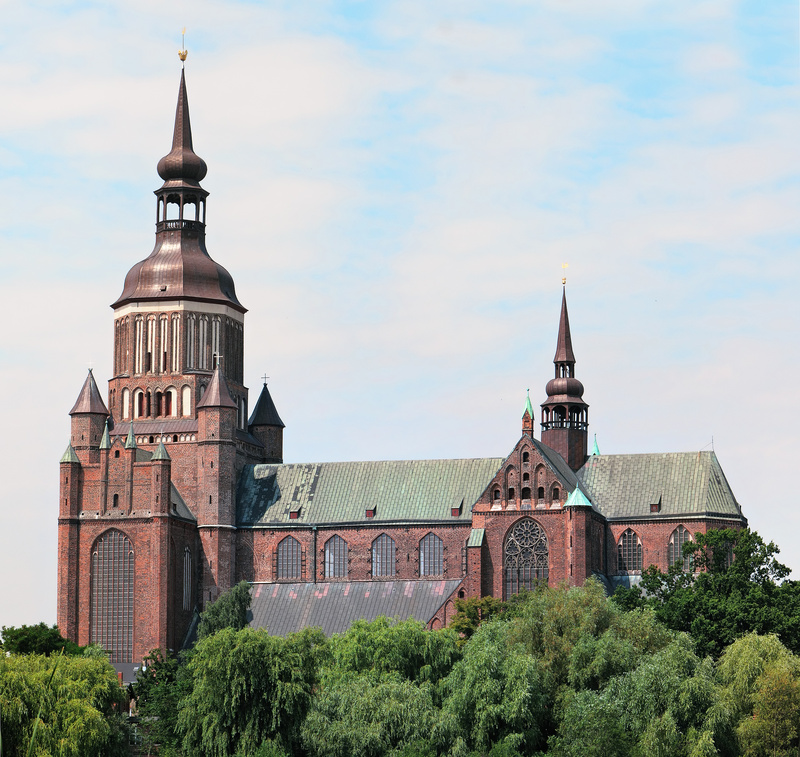 I haven’t researched the relevant records yet, but hope to get to Goteborg and Stralsund in the near future to do so. Beetz von Beetzen died in 1746, and Anna Ingaborg von Bitzen was born 124 years later in 1870. That would seem to be a span of maybe six or so generations, so working from both directions I should be able to connect the two individuals provided church and municipal records exist. As the family appears to have been pretty famous [see below] there is every reason to believe sufficient records can be found connecting the lineage. 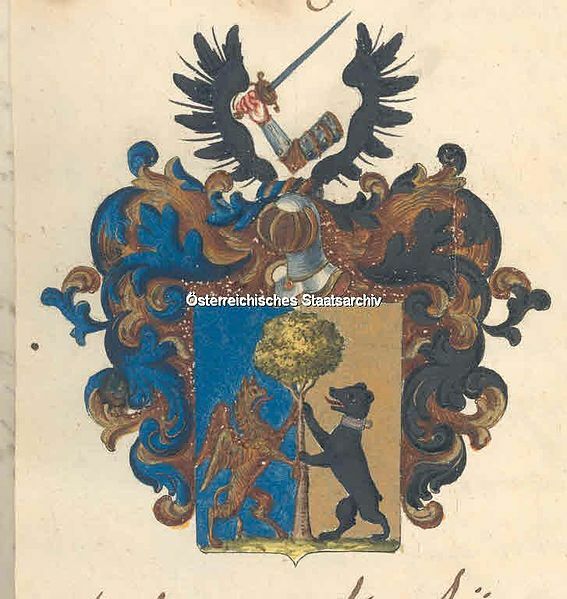 As I mentioned under Anna Ingaborg von Bitzen’s narrative, since Chrsitoph Beetz was ennobled (i.e., made an Imperial Knight) of the Holy Roman Empire, and as you and I are in a direct line of cognatic succession from him (“men and women in descending line in infinity”), that would make me a Knight (Sir Anthony) and you a Lady (Dame Liliana). “Christoph Beetz’ parents and grandparents were also famous and the Emperor’s close employees. Perhaps the family comes from a district called ‘Beetzendorf’ south of Berlin and can be related to the Beetzendorf Castle. But this is nevertheless very long ago, for instance at the 1300 century, due to a check about the ownership at Beetzendorf Castle. Some of his relatives held offices in the Swedish state. Christoph Beetz was one of the very famous from the Beetz family. He was married to Anna Sofia from Germany and had two sons, Johan Henrik von Beetzen (born in Stralsund about 1698) and Karl Joakim von Beetzen (born in Stralsund , November 1698). Karl Joakim was married to Anna Helena Giers (born 12 January 1707 in Gøteborg) from the famous Giers-family from Sweden that also has a famous Russian branch related to the named Russian Foreign Minister for about 13 years, Nikolai Giers (Nicholas de Giers), and a known English branch. So I can very likely trace our lineage back even further with some research, as the family was pretty famous. We know from the above that Beetz von Beetzen had two sons, Johan Henrik and Karl Joakim, so that would be the place to start tracing their lines, while at the same time tracing Anna Ingaborg von Bitzen’s ancestors (I know her date of birth and birth city, Goteborg, so that should be relatively easy provided proper records have been kept either at the municipal facilities or the church). Well, Lili, now you pretty much know as much about our ancestors as I do. I’m so glad I took the time to sit down with both Nonnie and Poppie and gather as much information as I could about these people. Otherwise, their lives would have been lost to us. One thing I learned by doing this history is that the ancestors were not just names and dates and so on, but were real people who lived full and interesting lives; they lived and struggled and fell in love and had kids and walked the Earth just as we do. Someday, I hope to go to all the places they lived and loved and walk the streets they walked, visit the churches they prayed at, and go to all their graves and pay my respects to their memories. Some day you and I will be the ancestors. I hope you pass on this history to your children and grandchildren so that they may know about and honor those who came befpore them. Was looking up pics of lindberg and Roosevelt field and stumbled upon your “labour of love” – A fine job, well done. My brother and I are 64yrs old (twins) from England, May 53 immigrated to Canada, Between us we have 7 childern that we barely see. They know next to nothing about the family history. I’m going to talk to my brother about doing a family blog. Thanks for the inspiration. Hi Tony, My Uncle Steven sent me this link. I am the grandaughter of Harry Kotz, your grandfather’s brother. Funny thing, My grandmother on my mom’s side is a Del Vecchio. Wonder if there is any relation there as well.